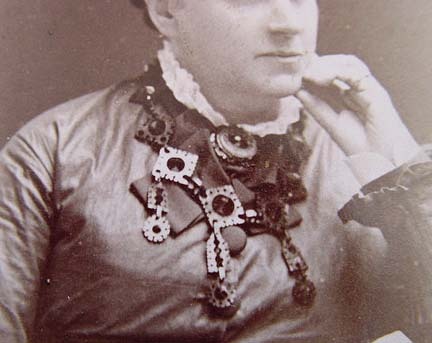 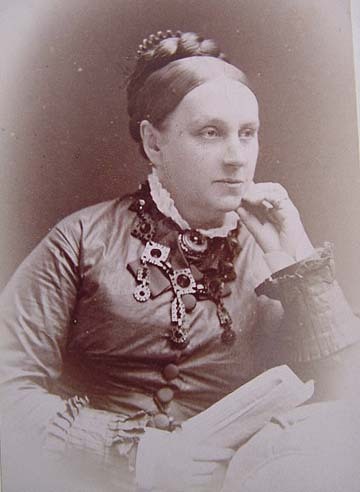 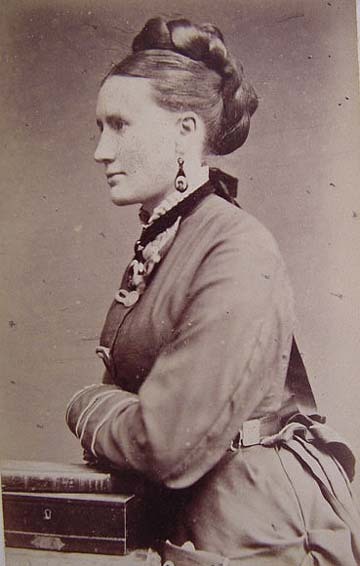 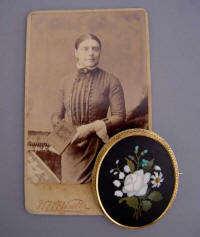 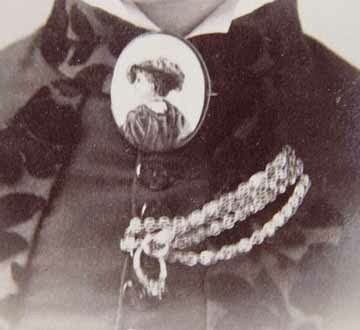 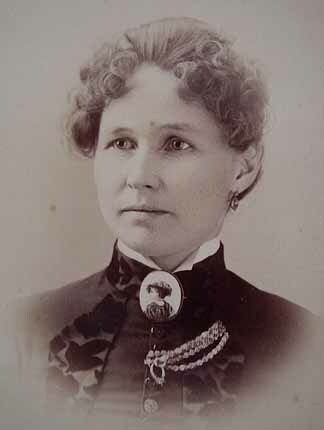 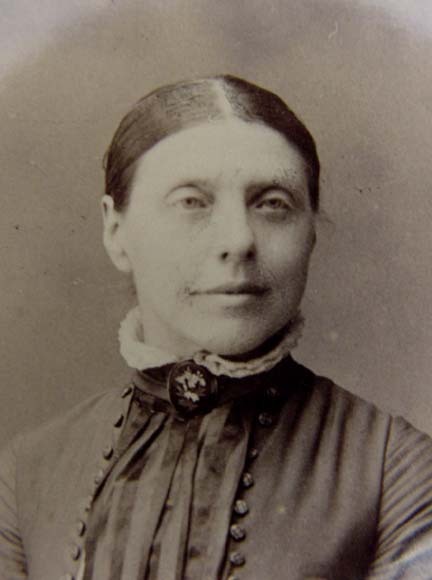 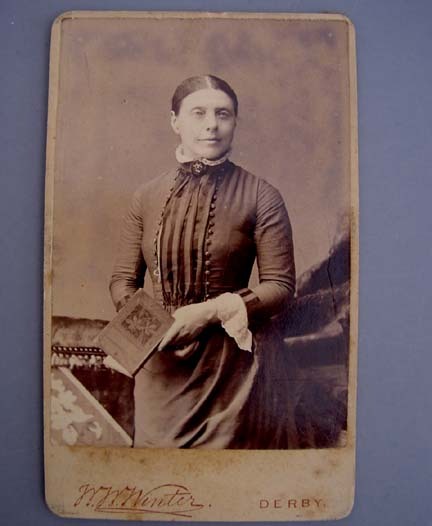 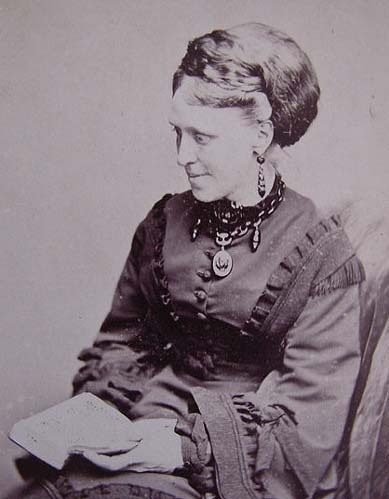 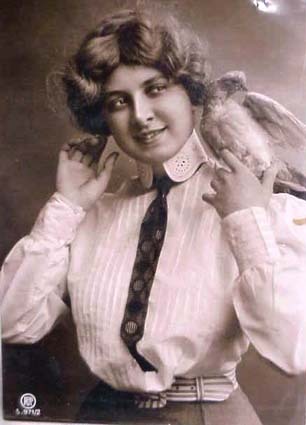 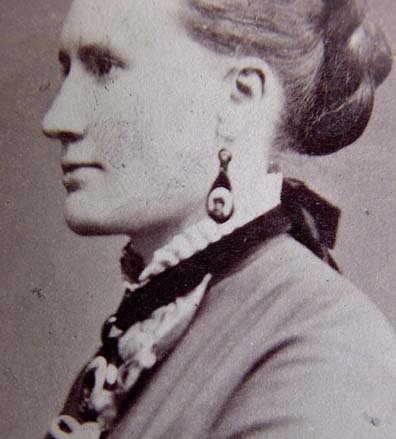 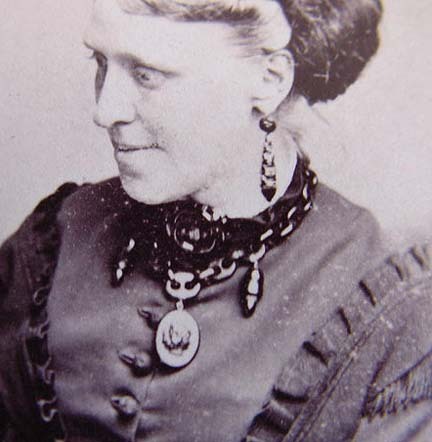 VICTORIAN lady wearing a portrait brooch, cut steel buttons and diamond earrings. 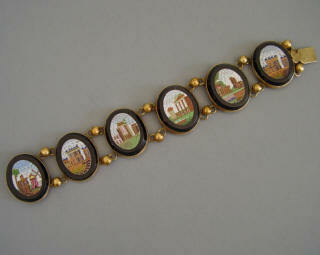 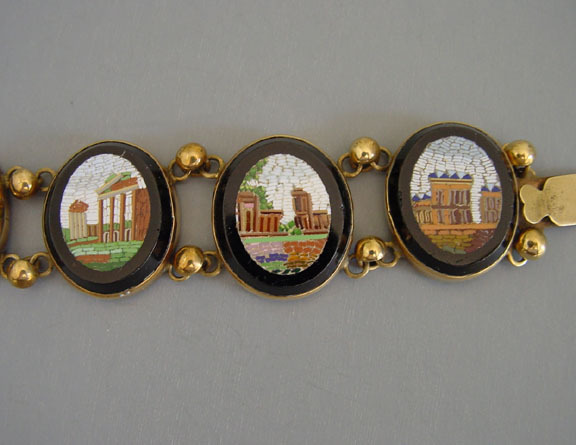 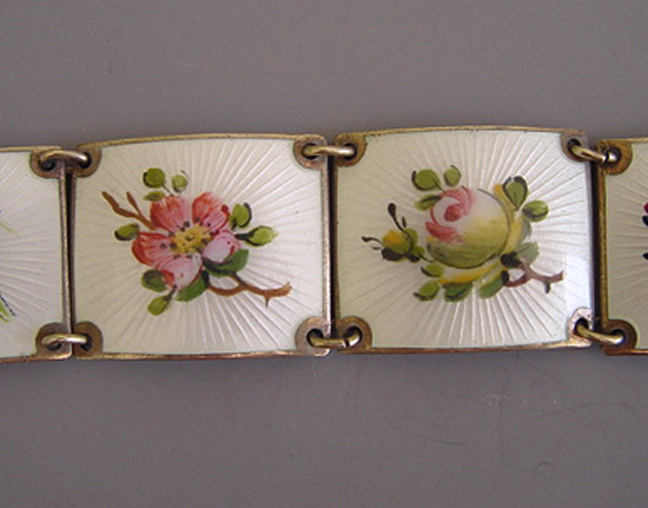 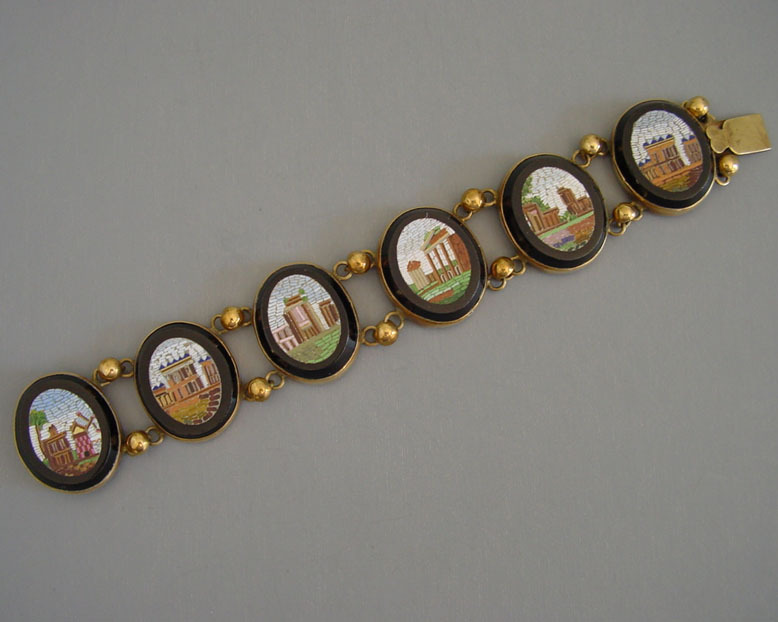 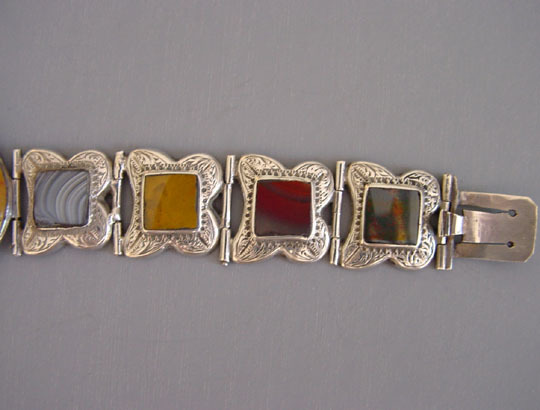 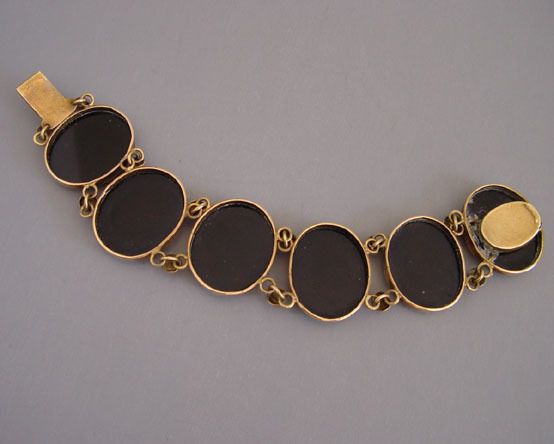 Cabinet card size 4-1/4" by 6-1/2", marked "J. O. Herbert, Grand Rapids, Wis."
VICTORIAN silver and agates pebble bracelet with garter motif, 7" by 1-1/3" front and 3/4" band, engraved initials on the back "MC". 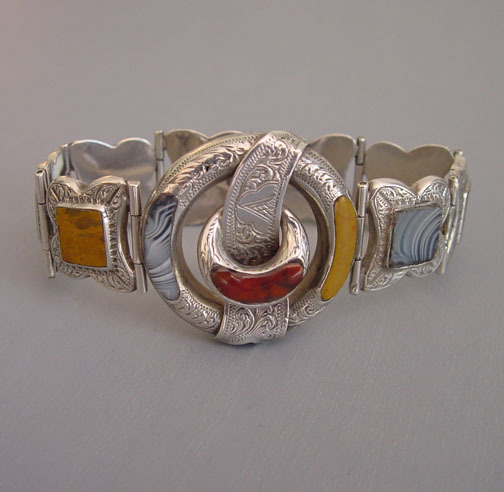 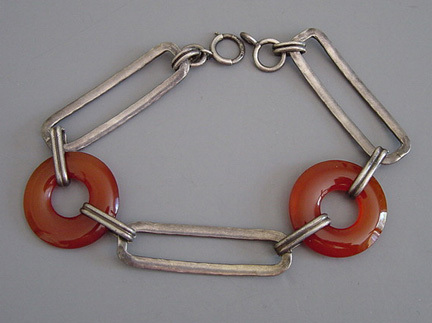 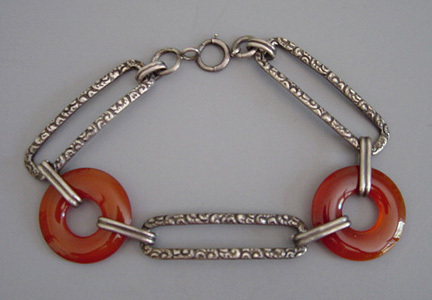 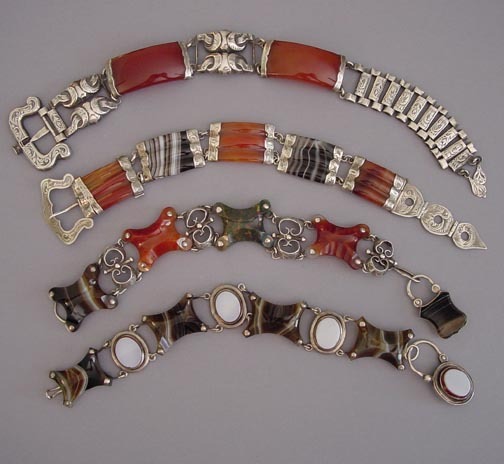 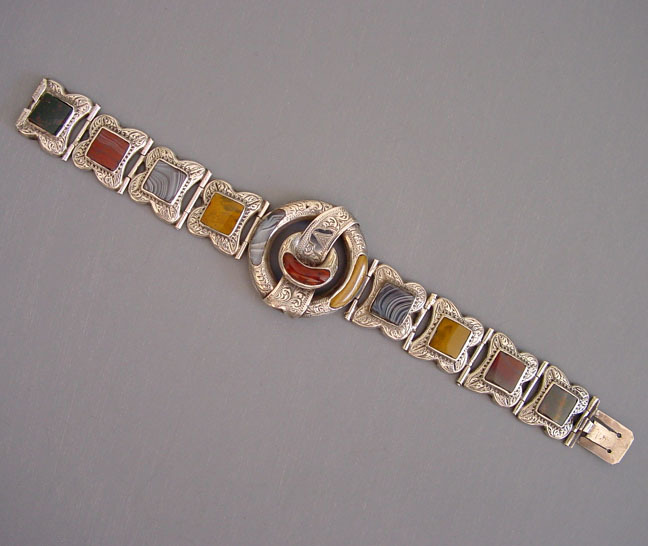 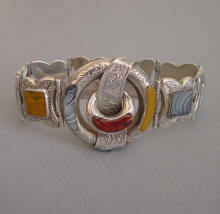 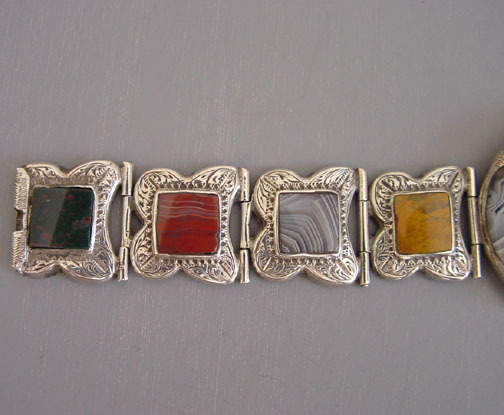 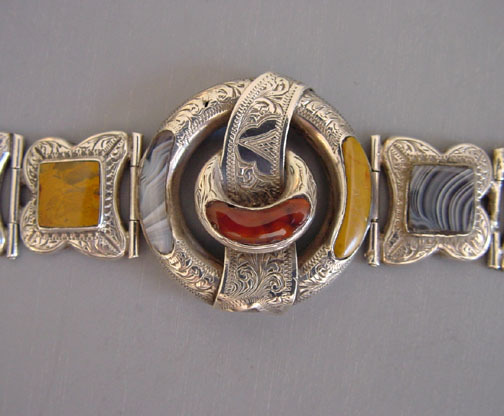 View View View View View View #V33615 VICTORIAN Scottish pebble style agate and sterling bracelets. 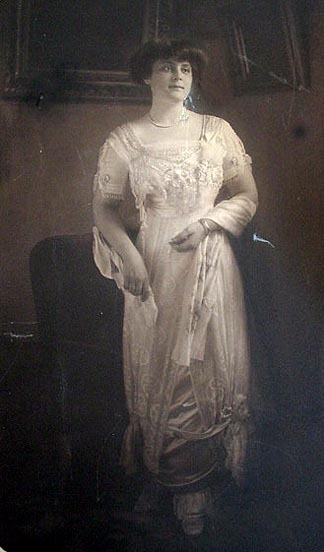 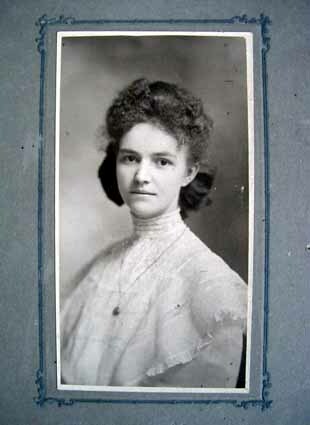 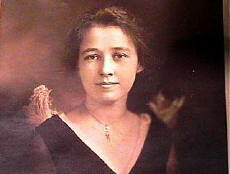 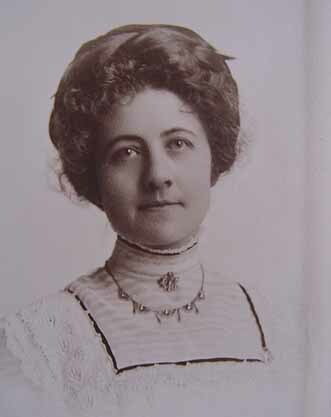 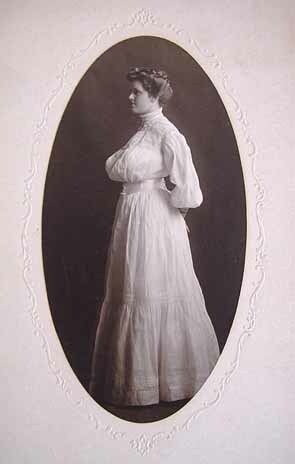 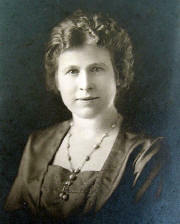 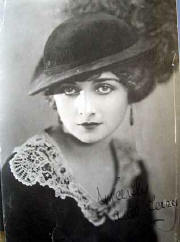 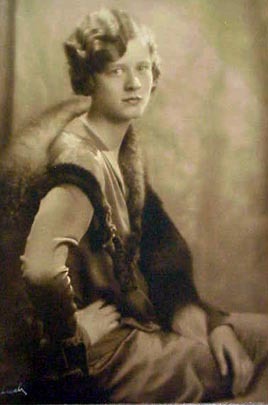 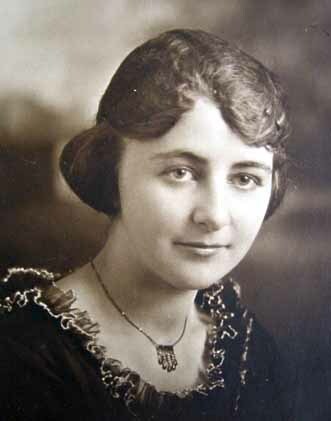 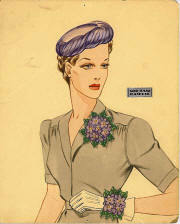 High necked blouses and upswept hairdos were a feminine look for the early 1900's. 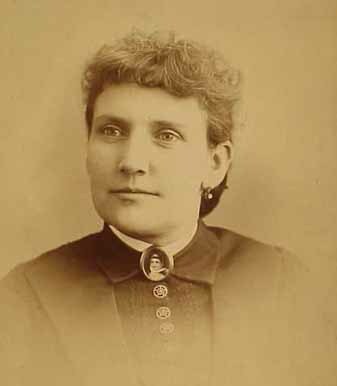 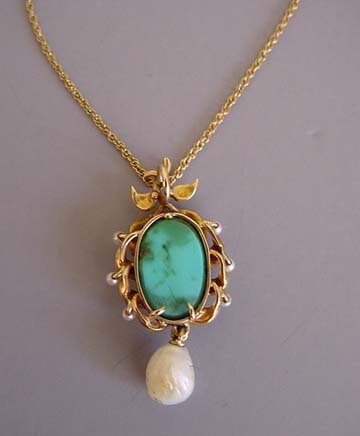 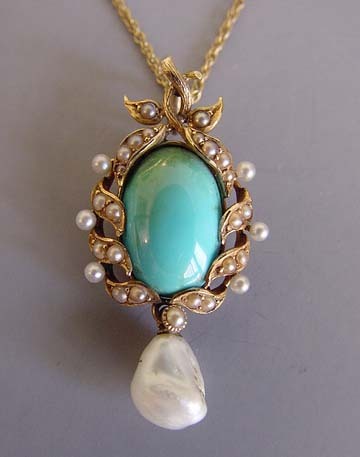 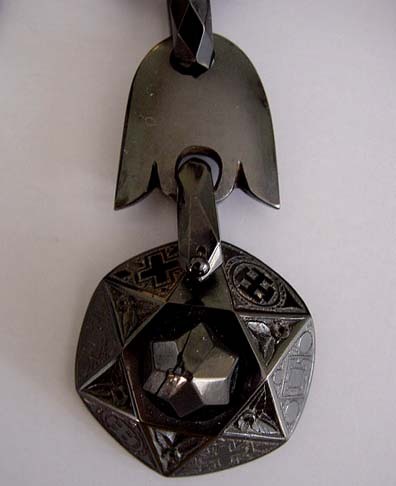 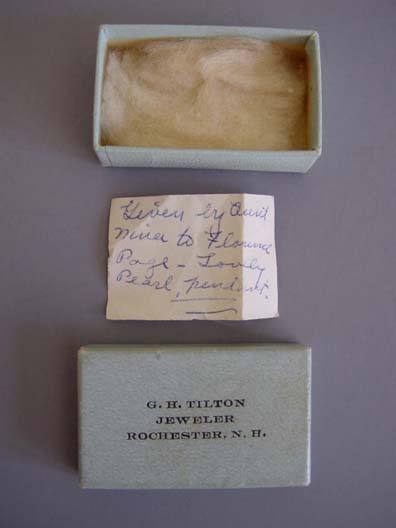 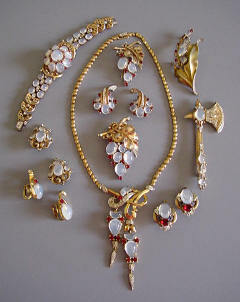 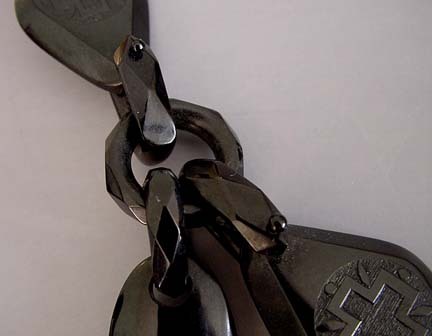 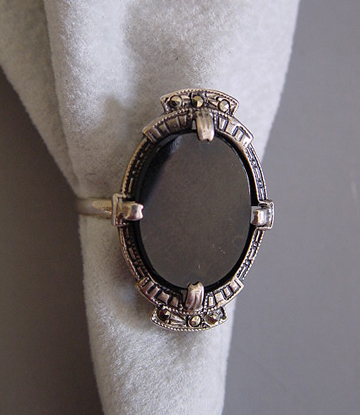 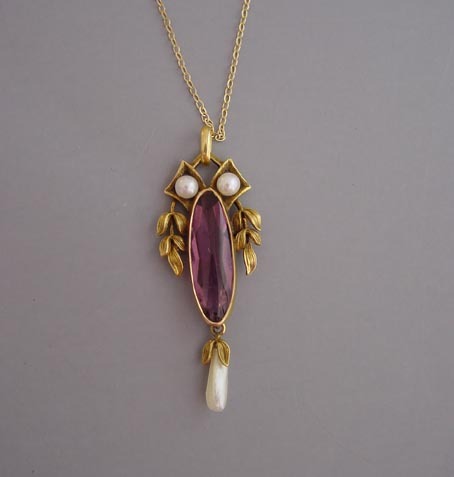 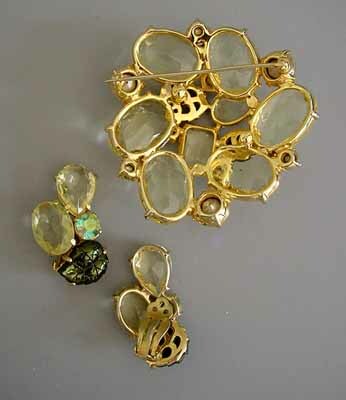 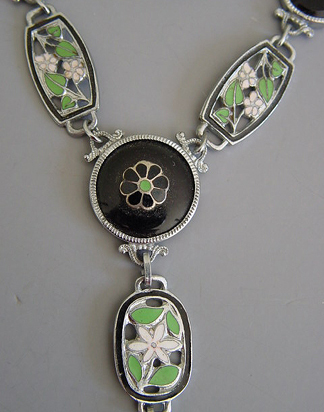 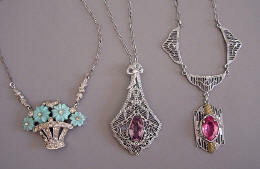 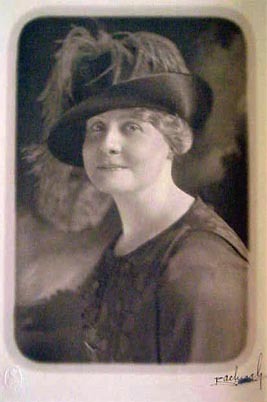 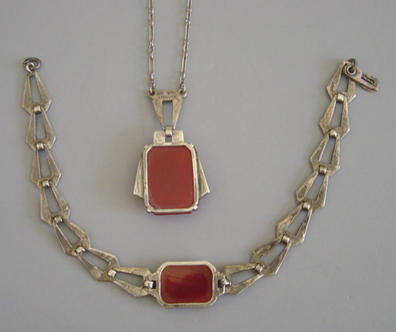 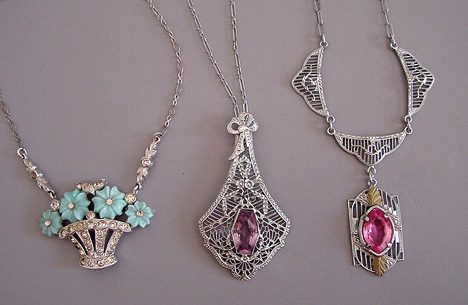 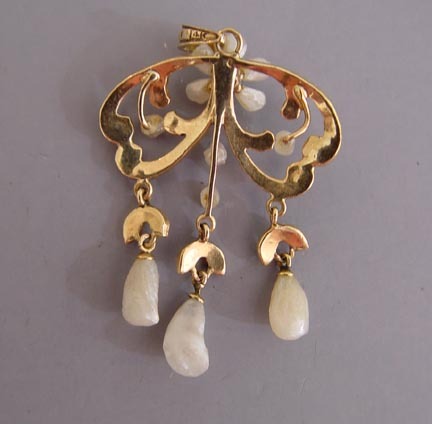 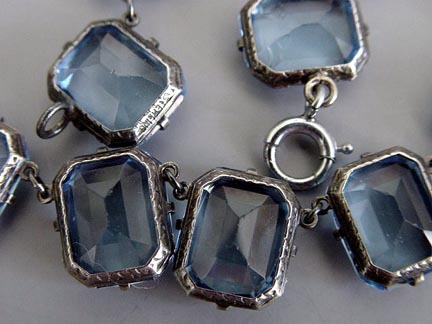 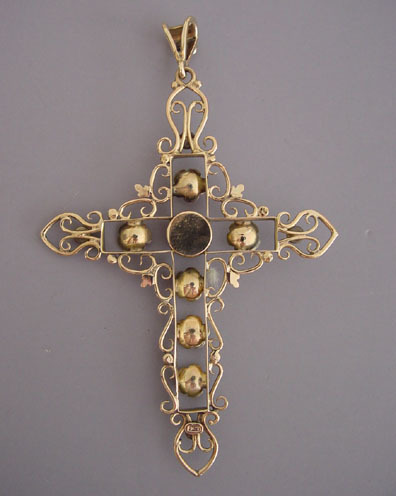 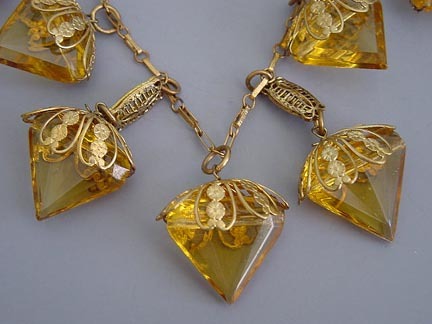 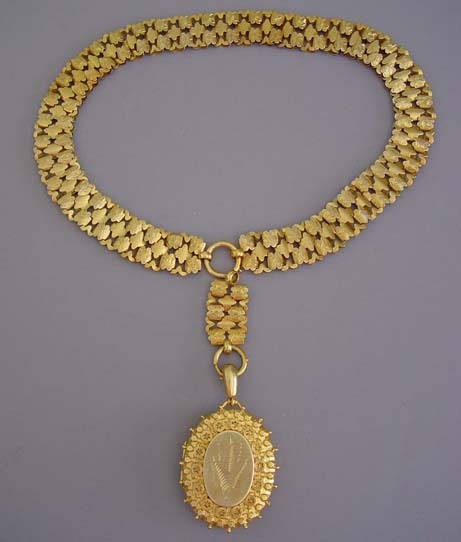 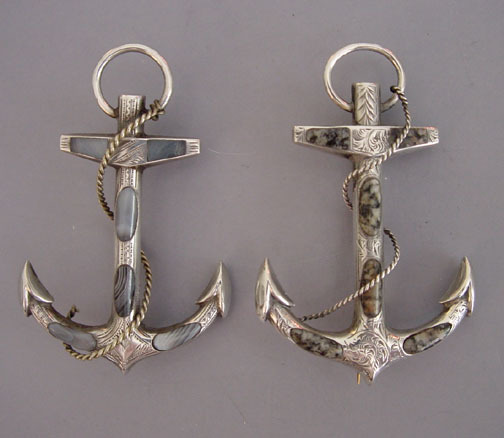 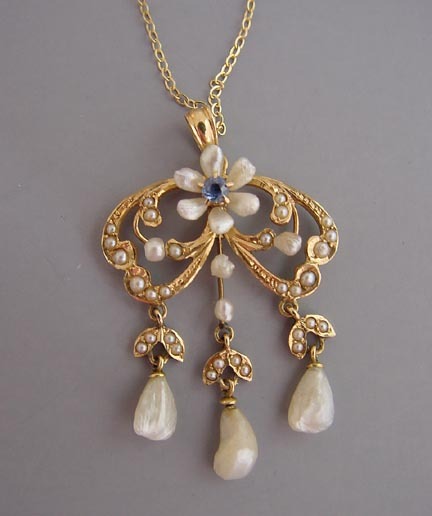 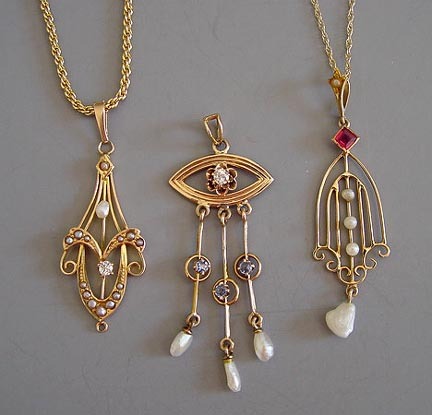 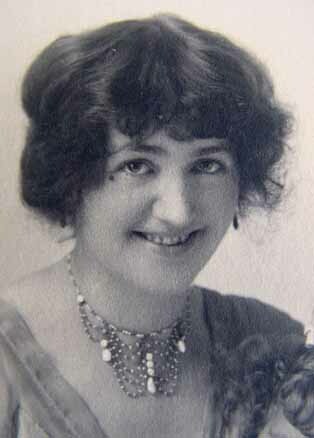 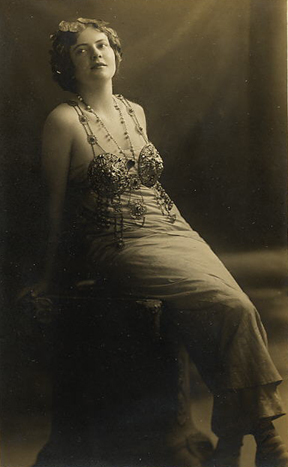 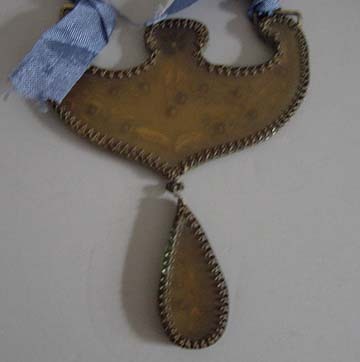 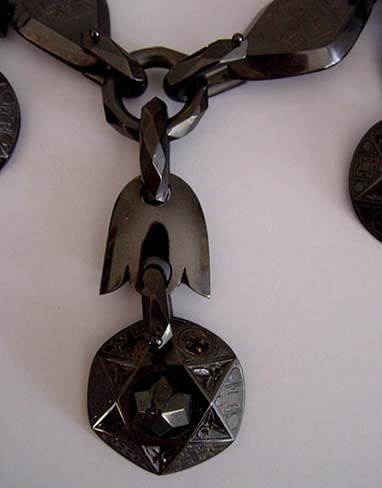 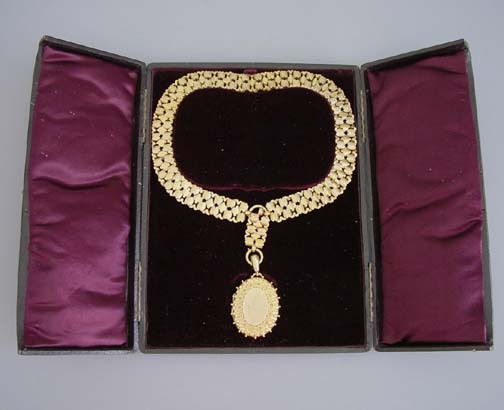 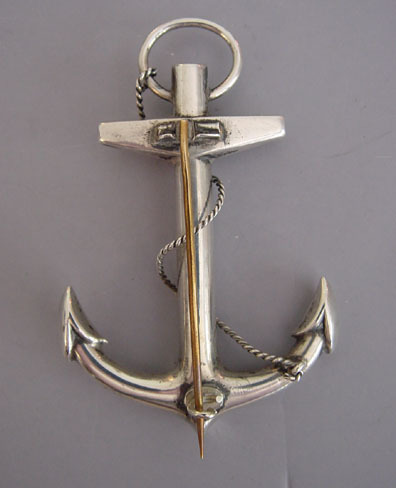 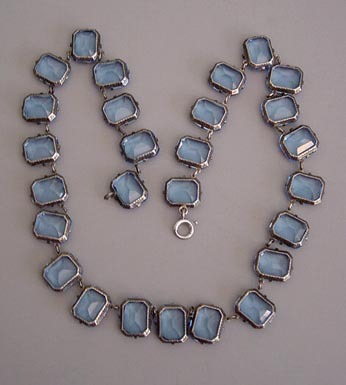 Dainty lavalieres are seen in many photographs of the early 1900's. 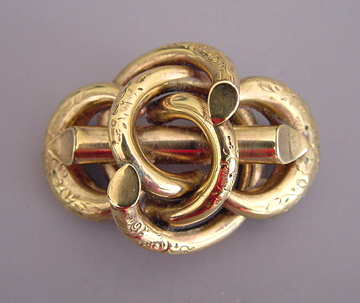 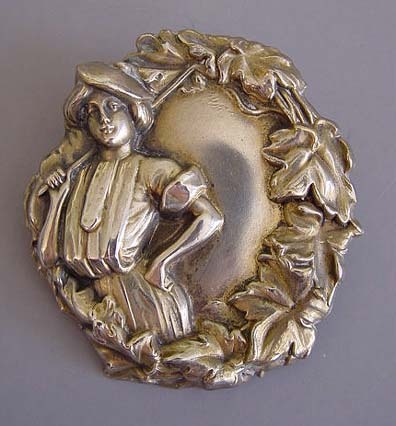 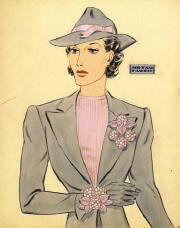 A lovely small waist is ornamented with a striped belt and fancy buckle or sash pin. 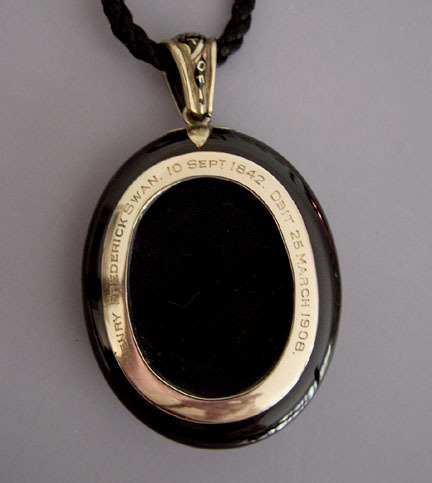 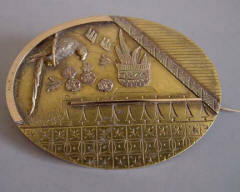 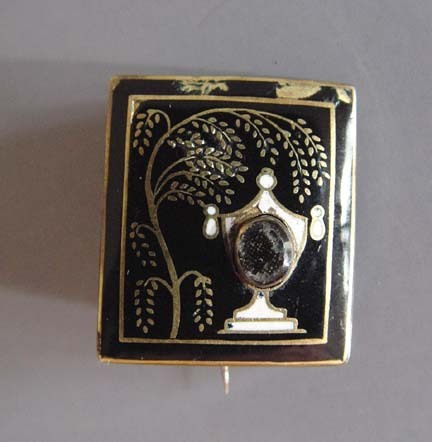 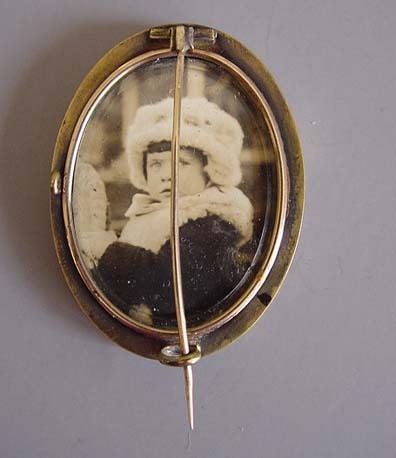 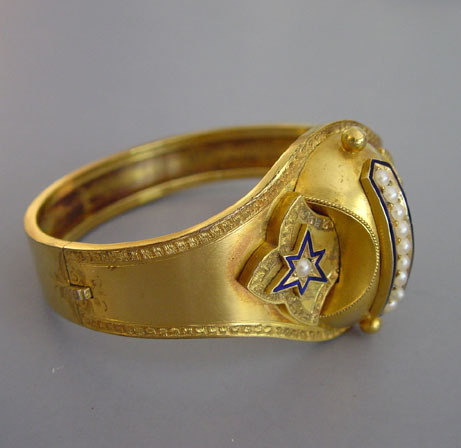 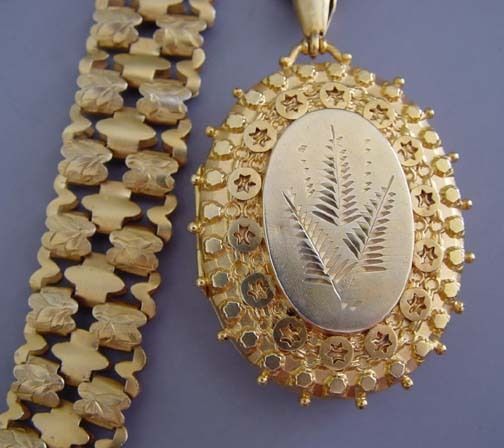 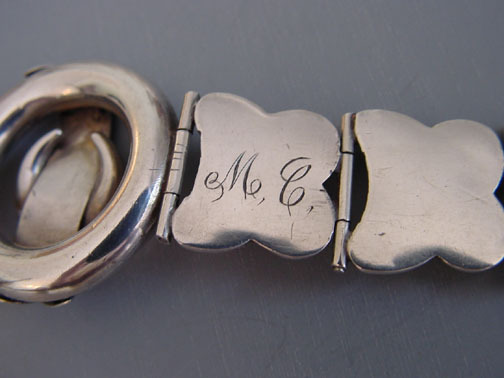 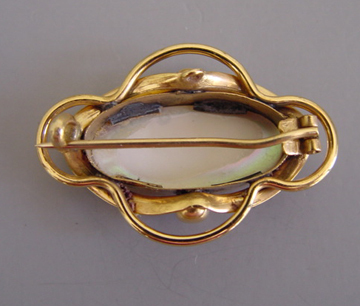 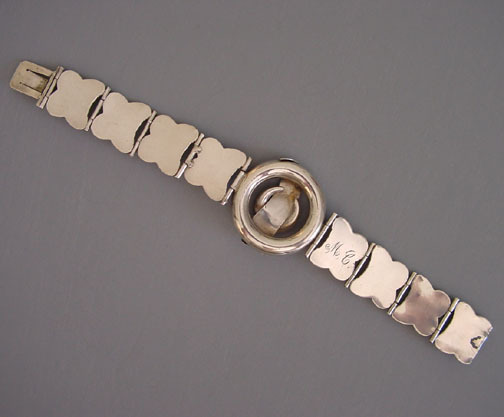 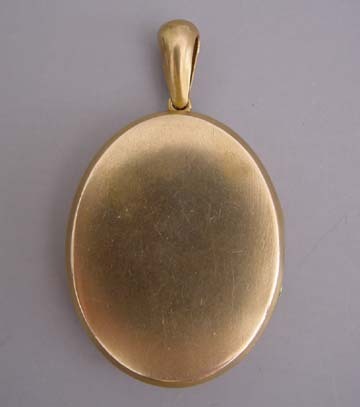 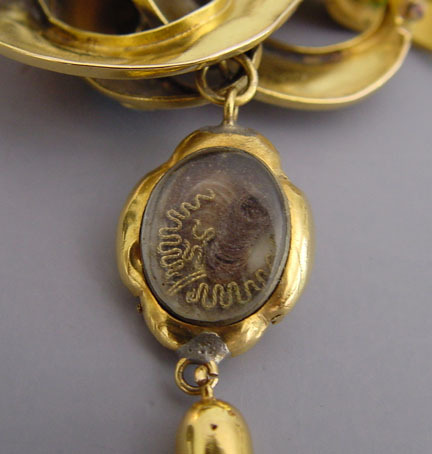 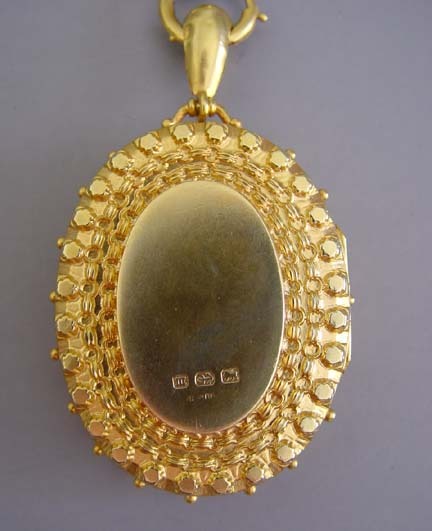 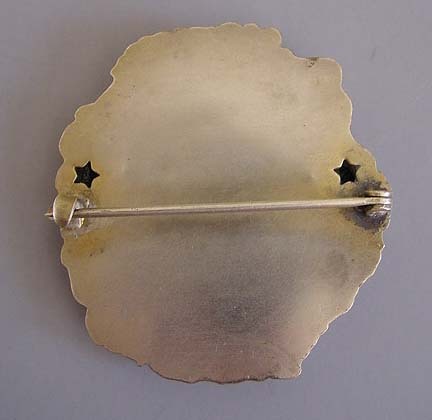 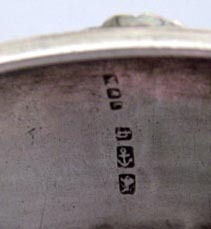 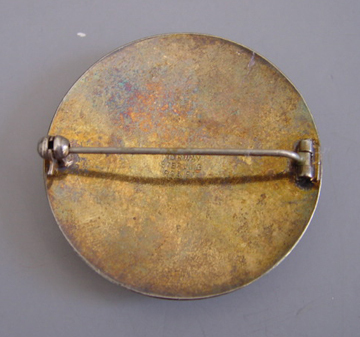 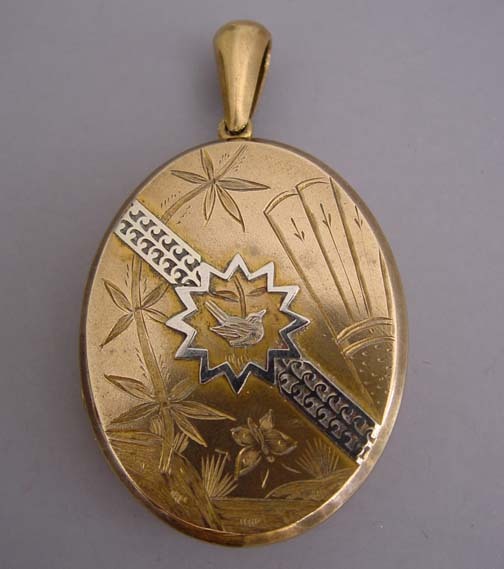 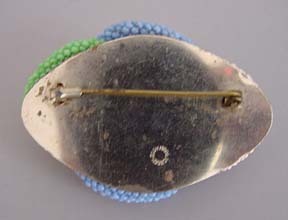 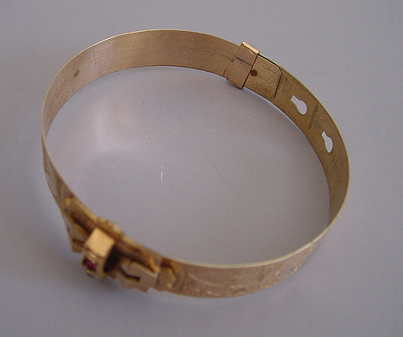 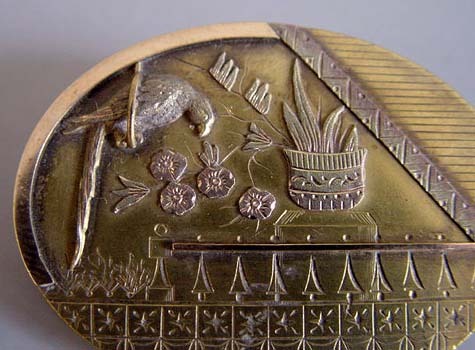 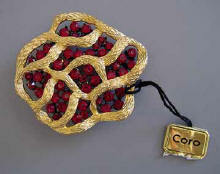 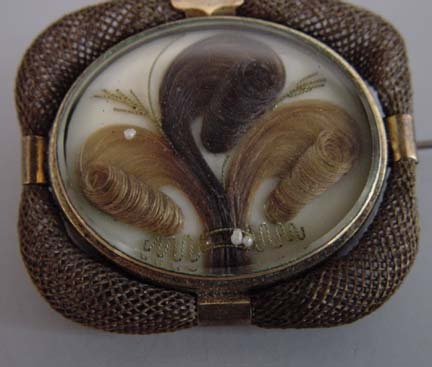 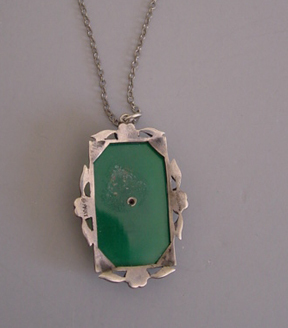 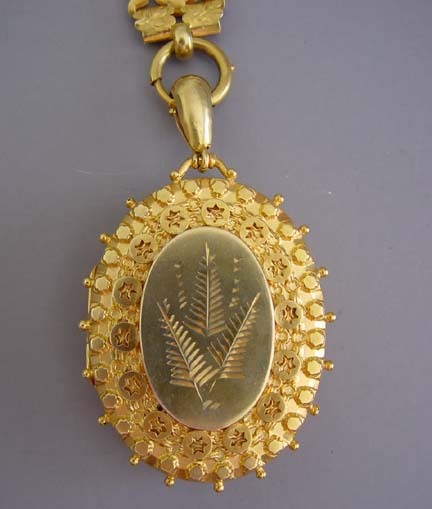 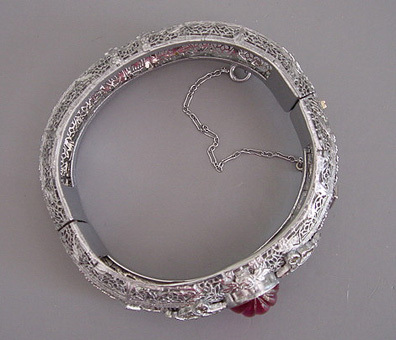 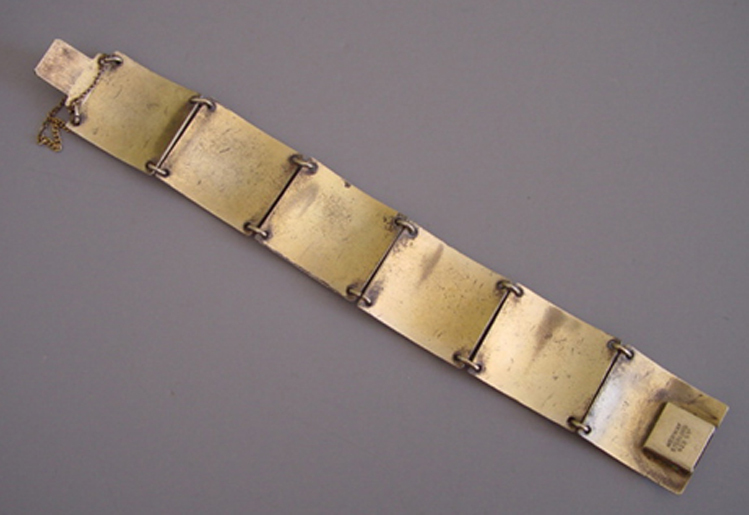 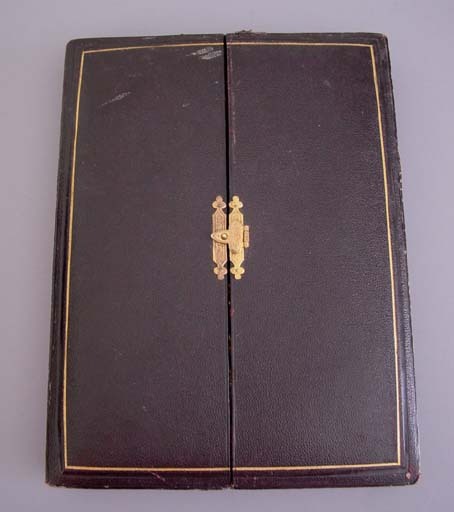 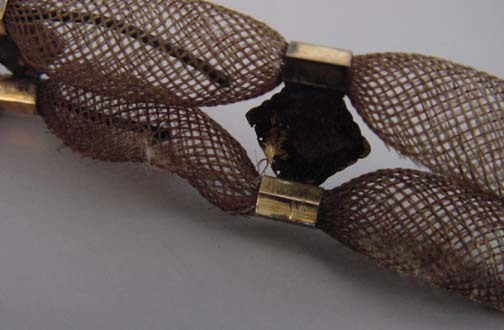 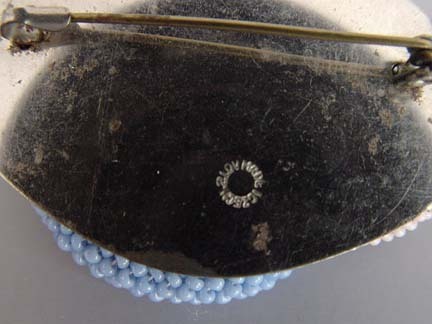 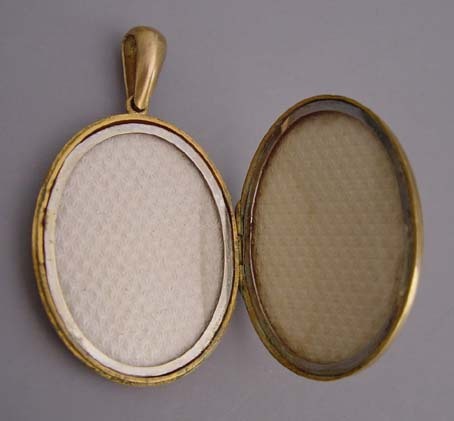 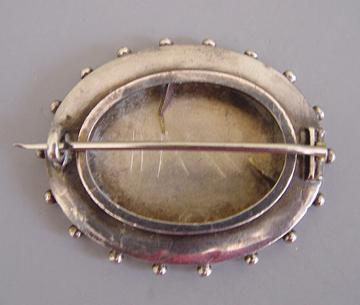 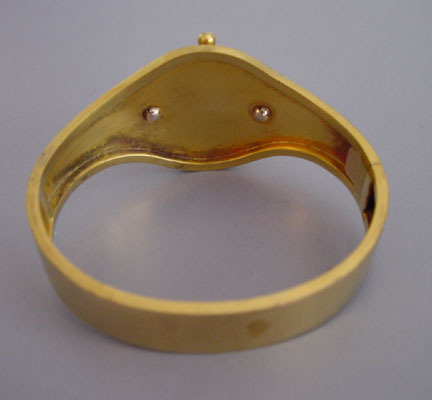 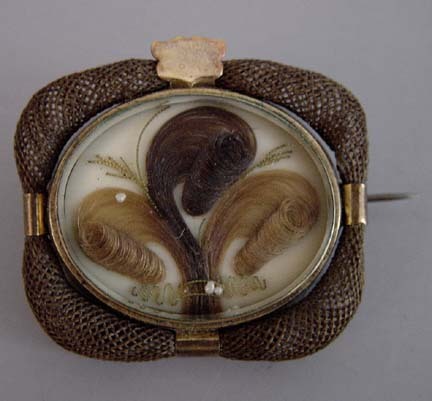 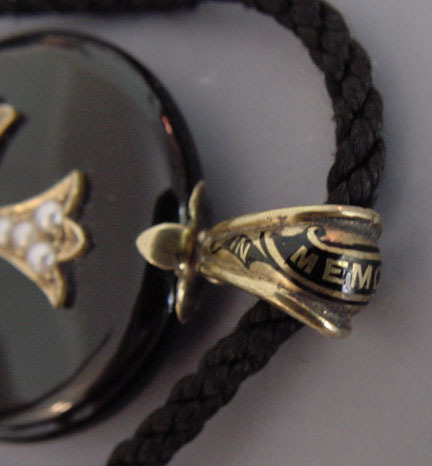 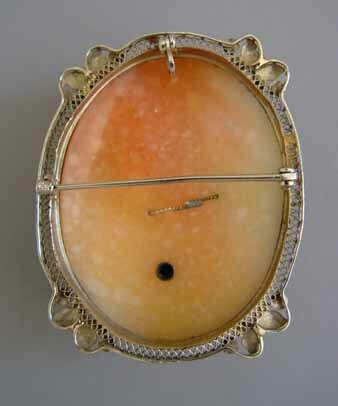 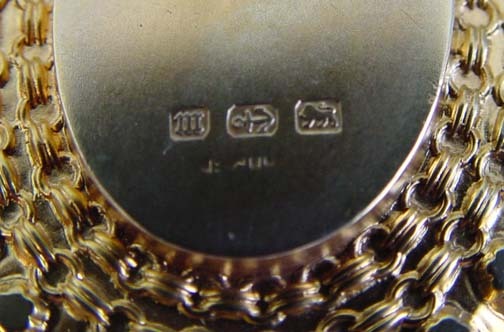 Sentimental hair locket may have contained the hair of a sweetheart. 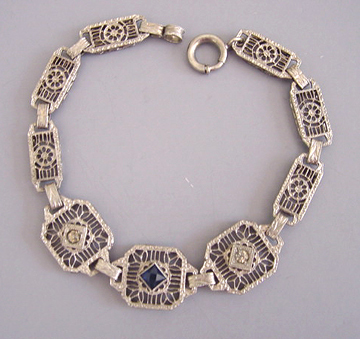 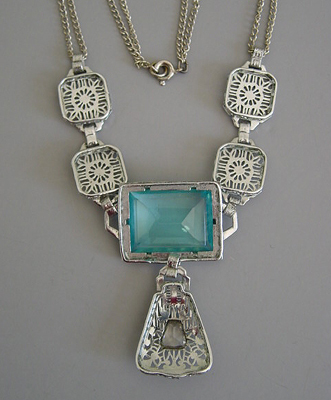 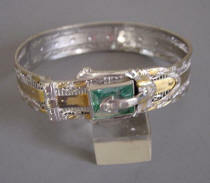 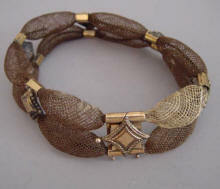 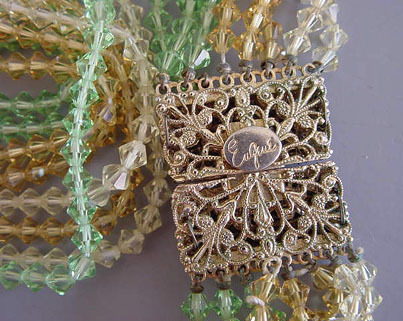 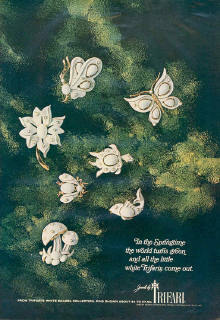 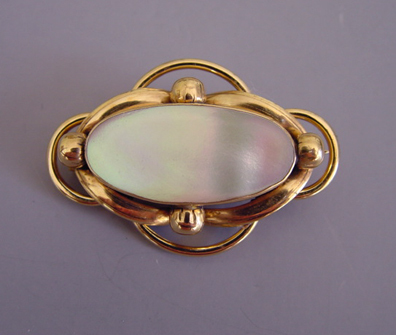 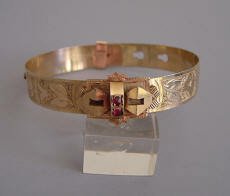 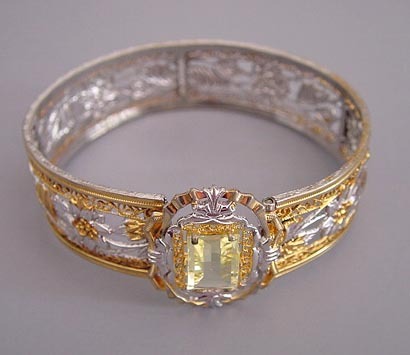 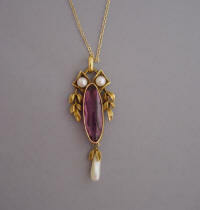 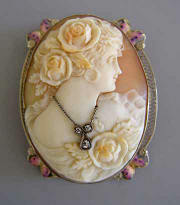 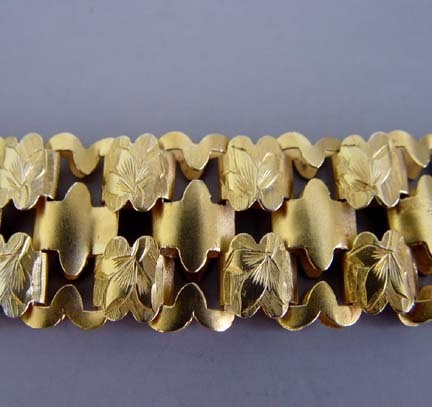 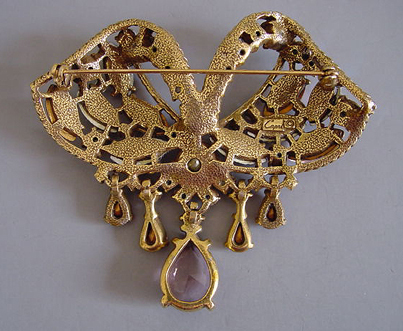 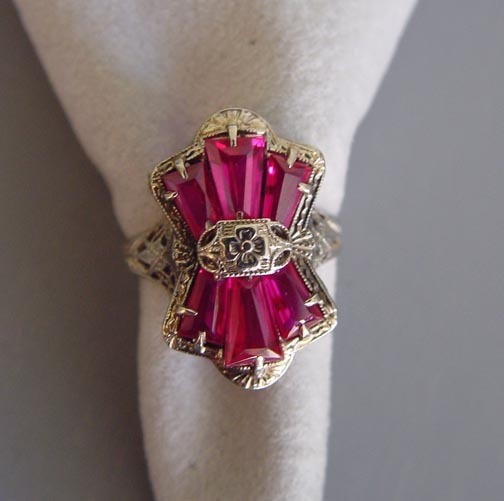 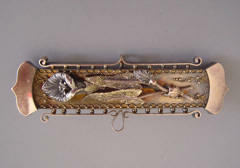 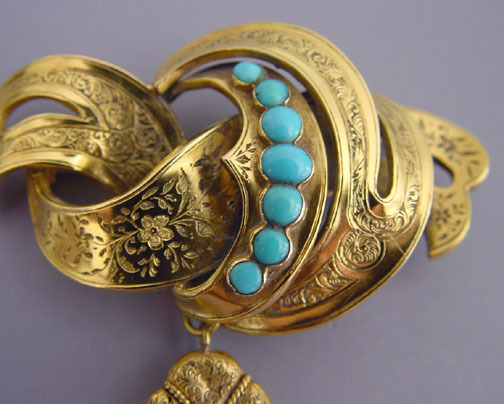 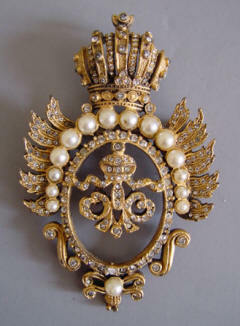 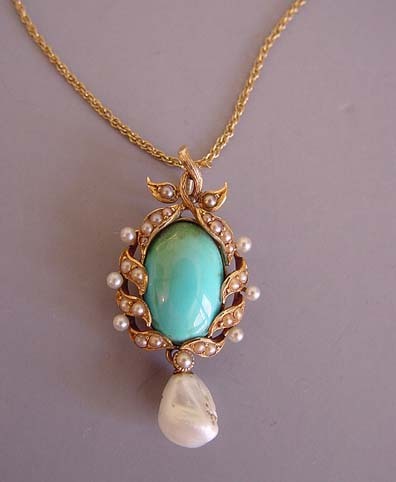 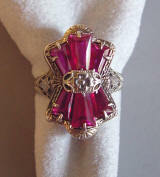 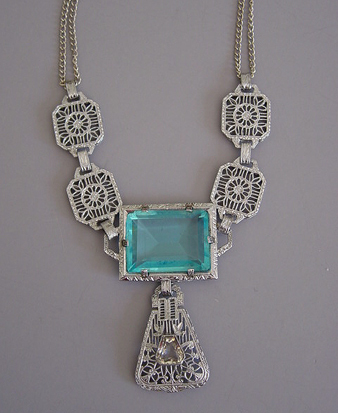 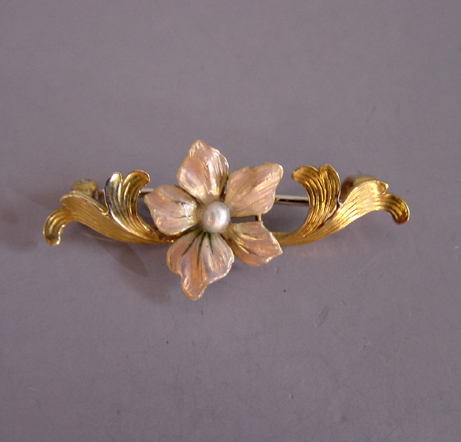 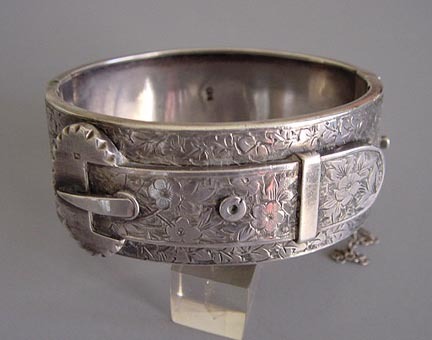 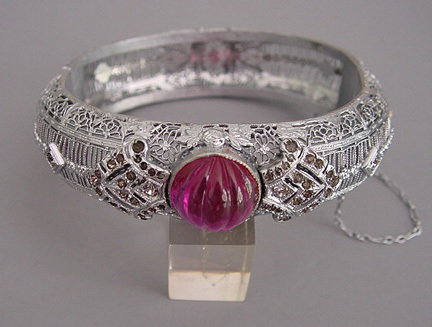 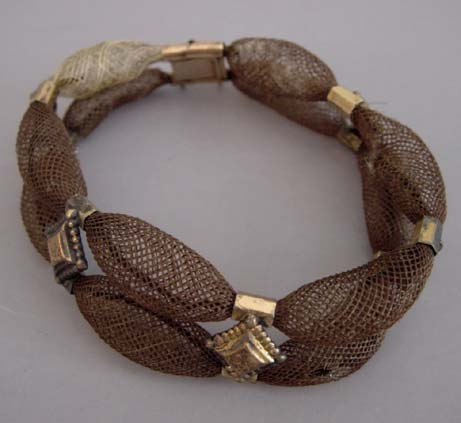 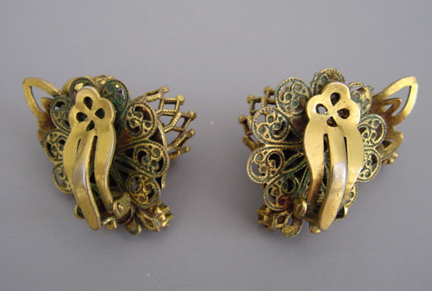 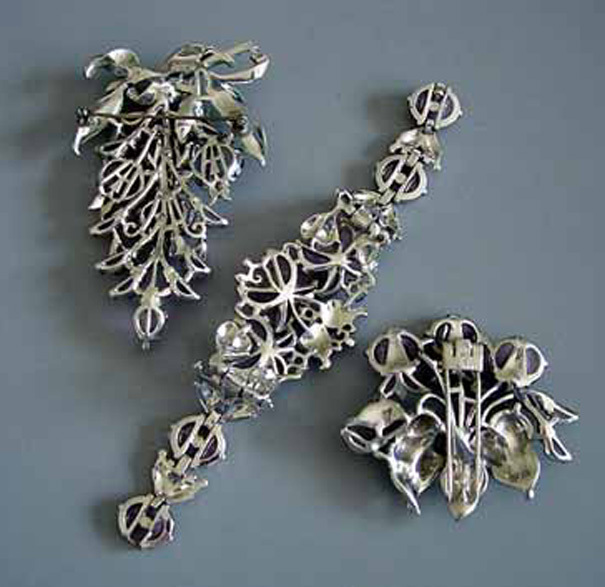 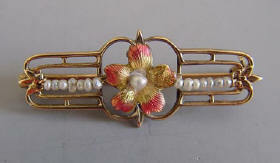 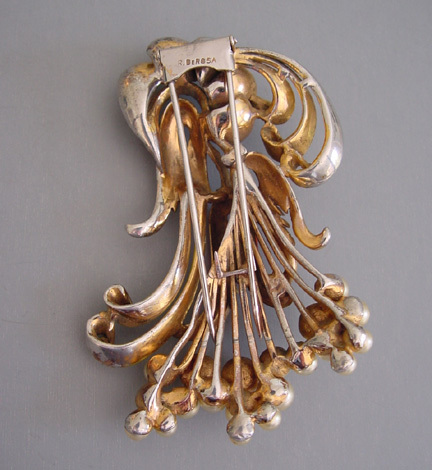 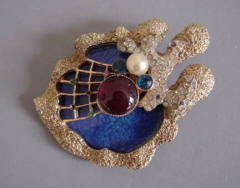 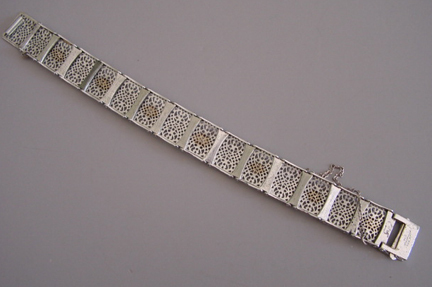 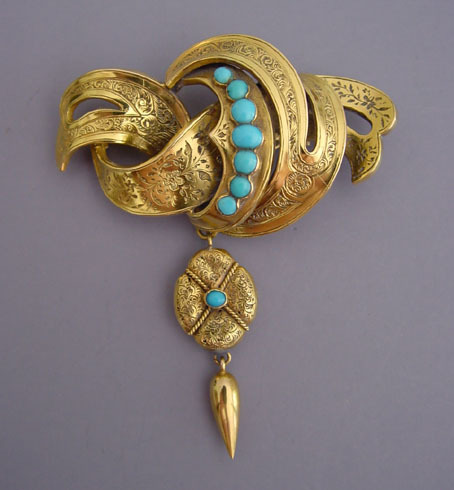 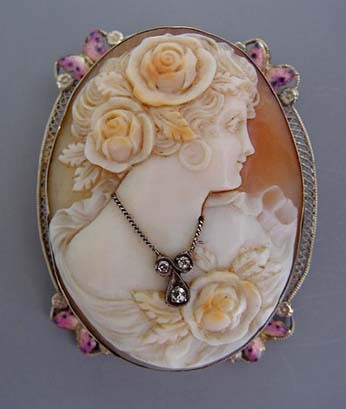 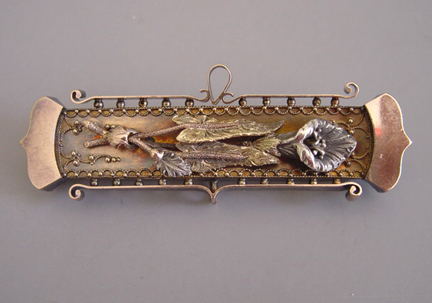 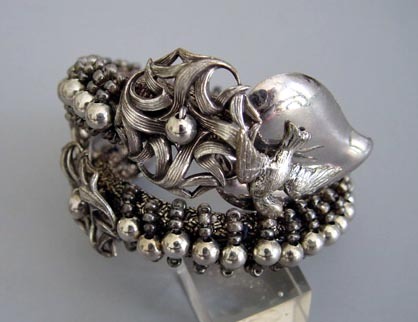 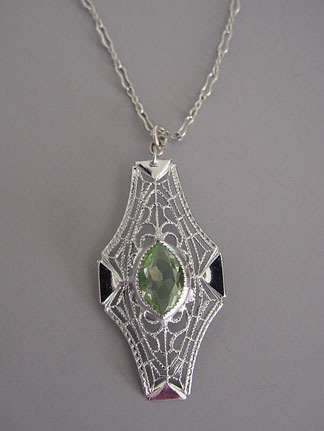 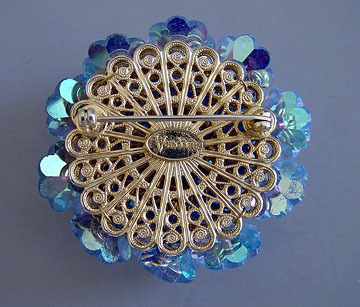 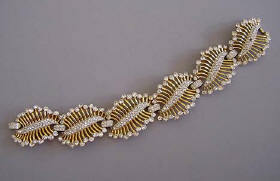 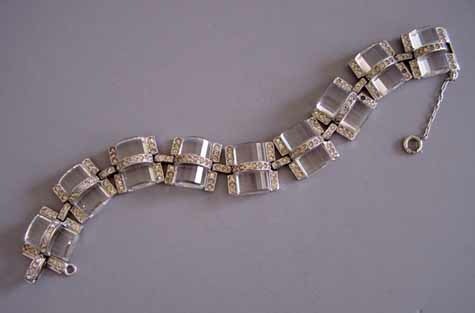 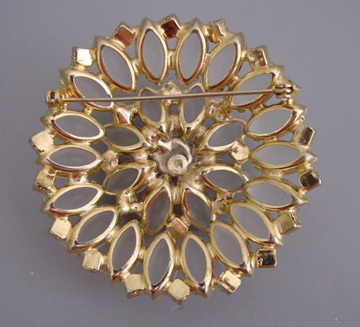 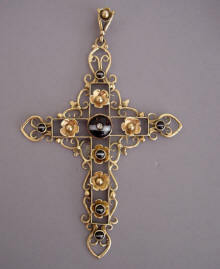 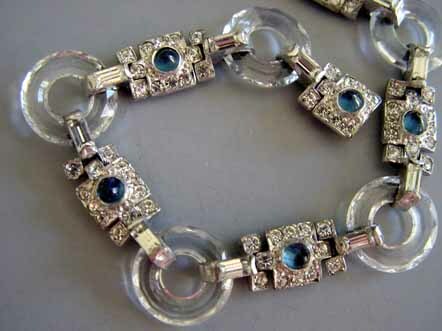 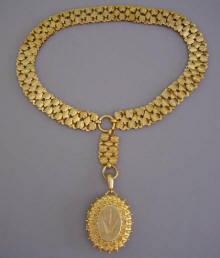 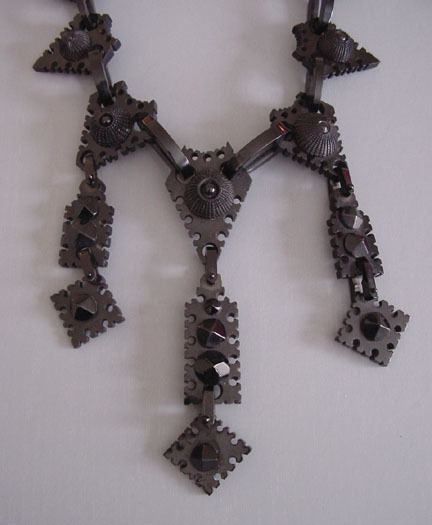 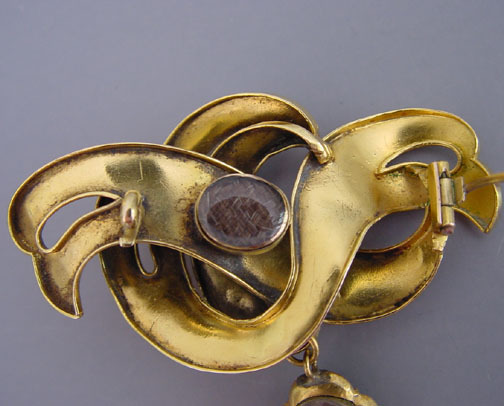 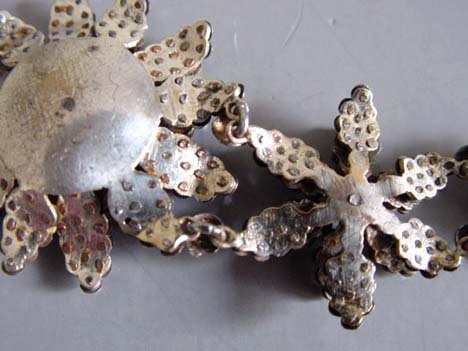 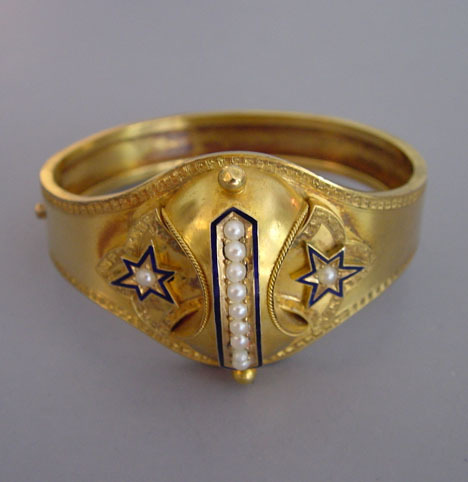 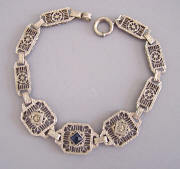 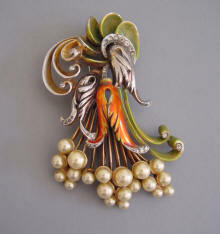 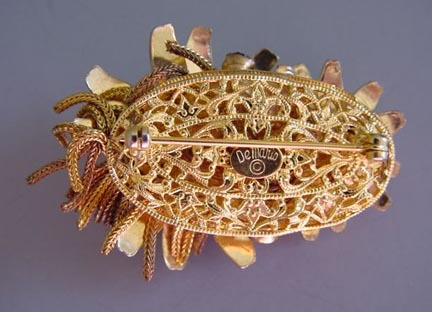 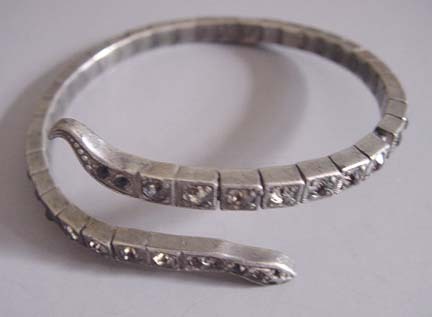 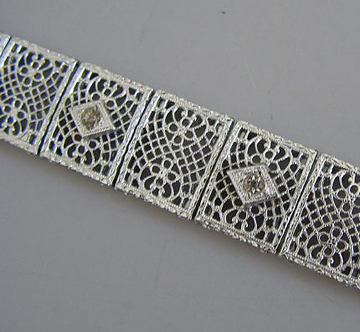 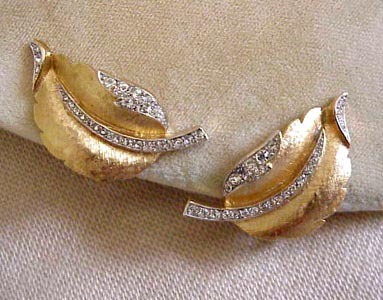 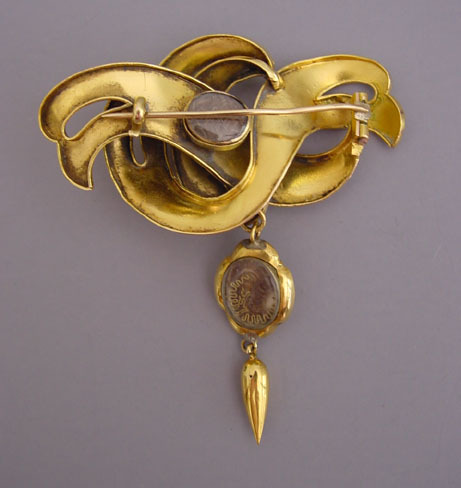 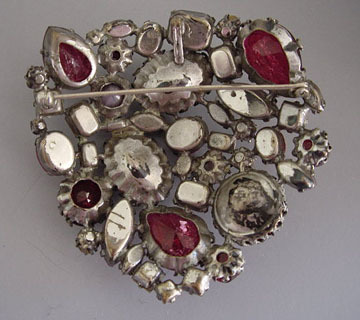 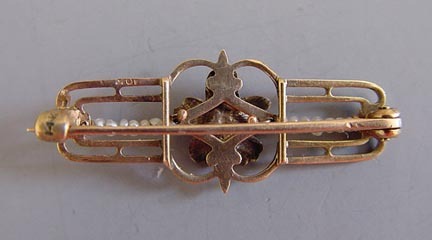 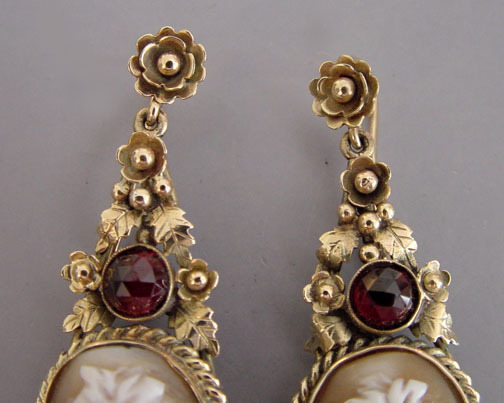 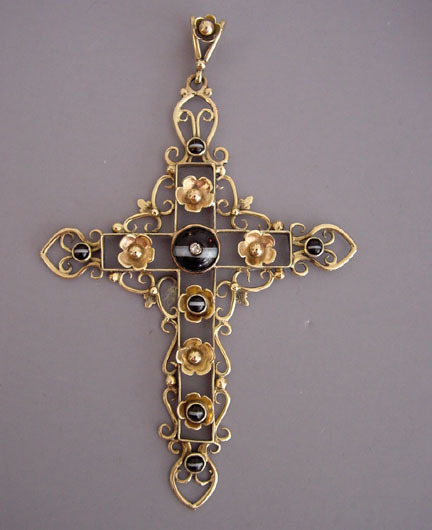 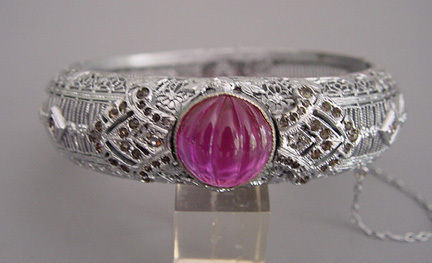 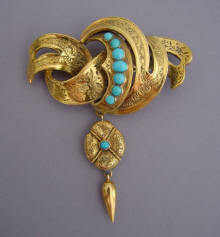 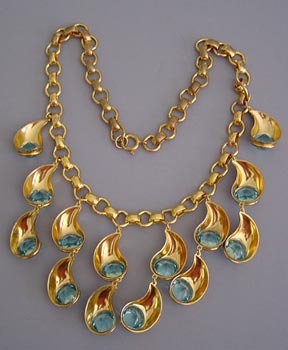 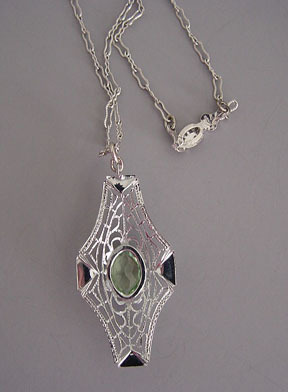 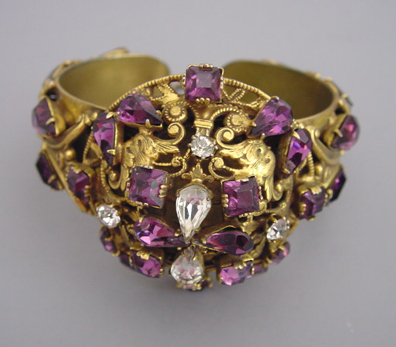 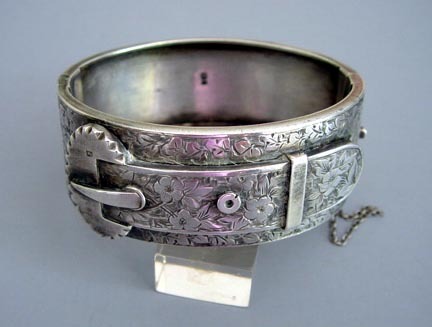 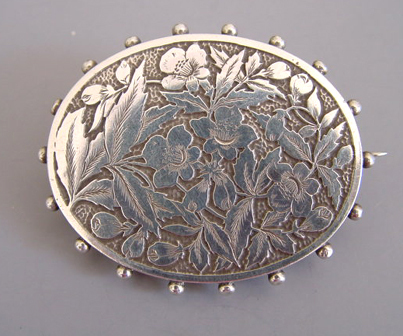 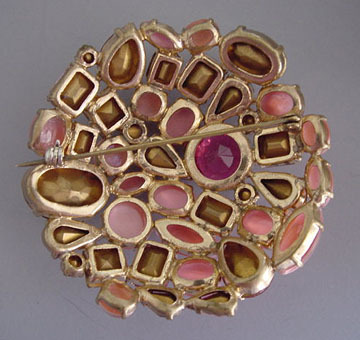 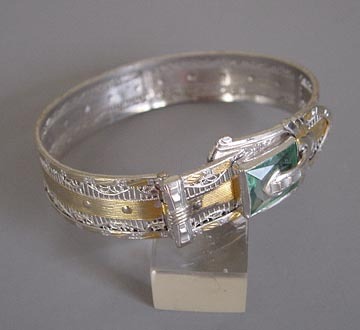 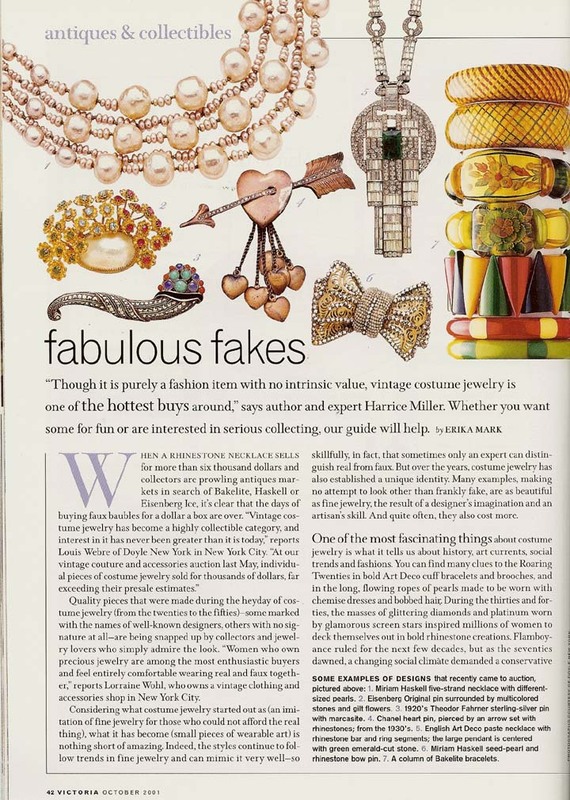 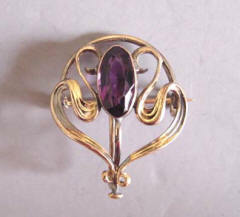 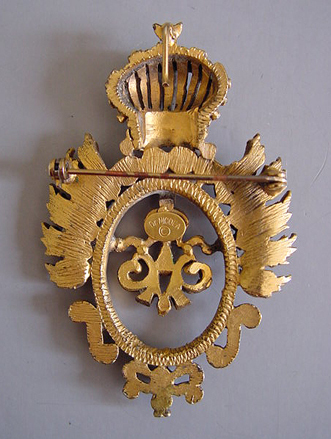 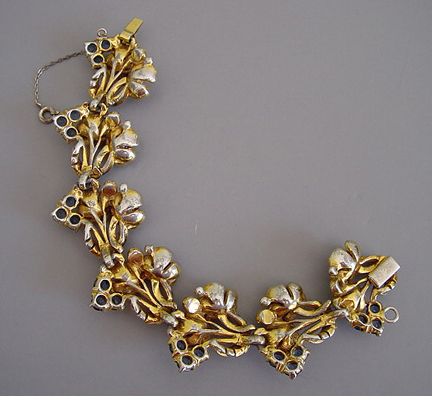 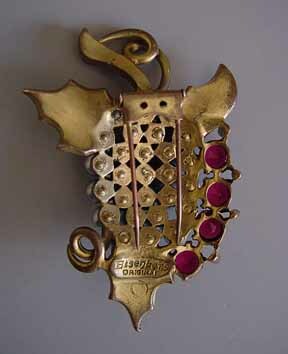 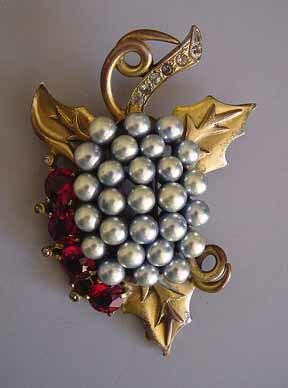 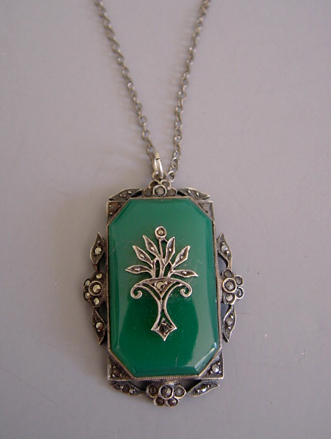 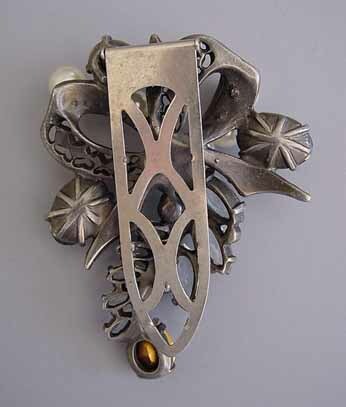 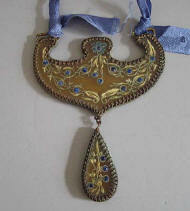 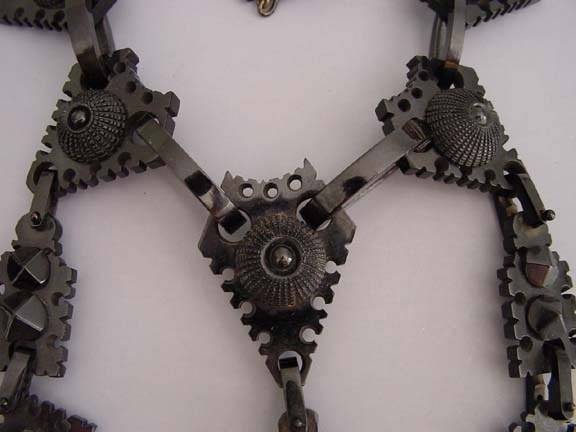 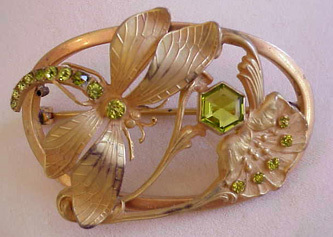 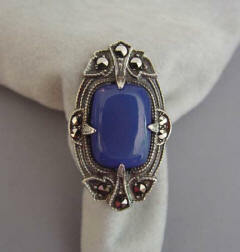 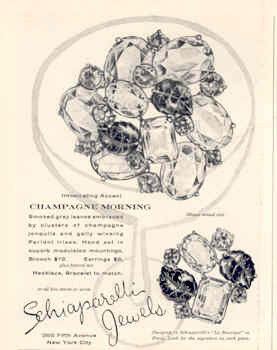 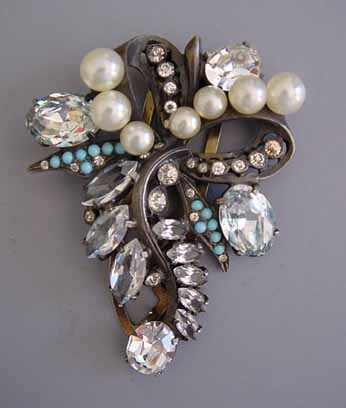 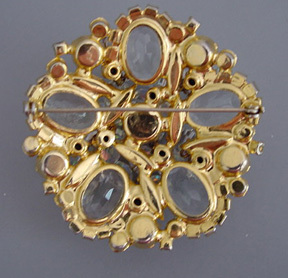 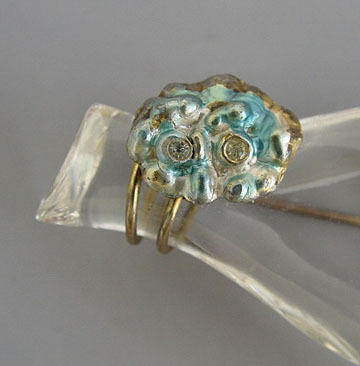 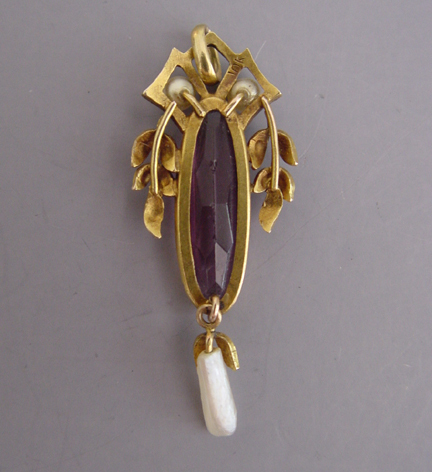 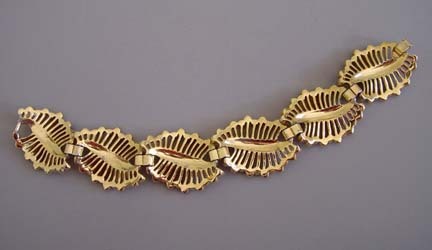 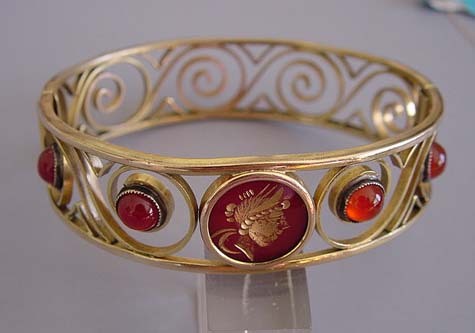 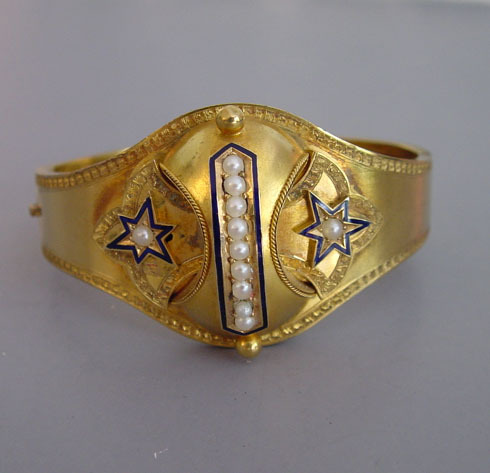 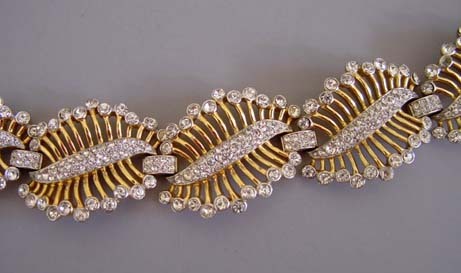 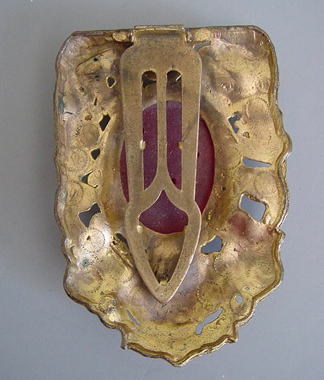 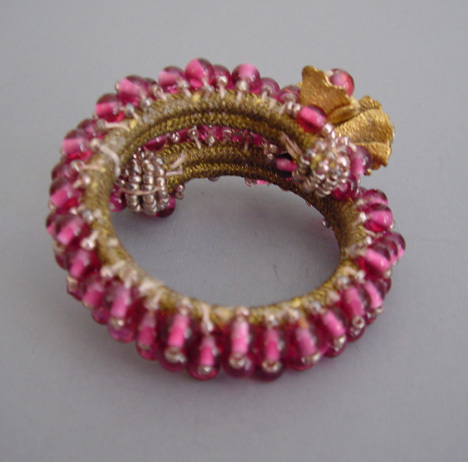 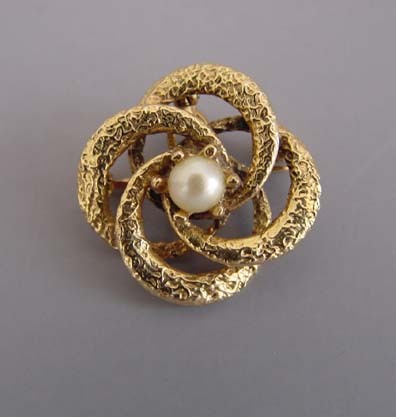 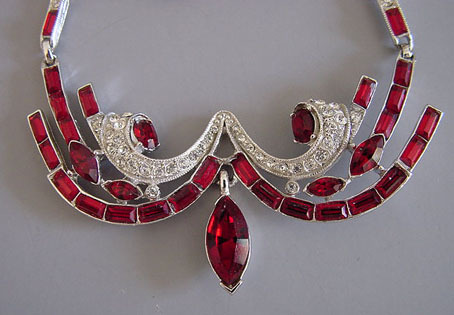 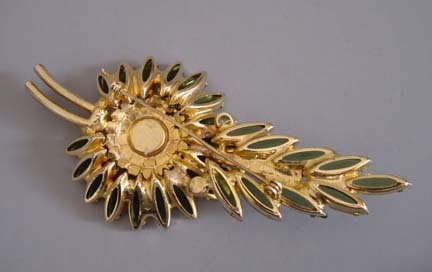 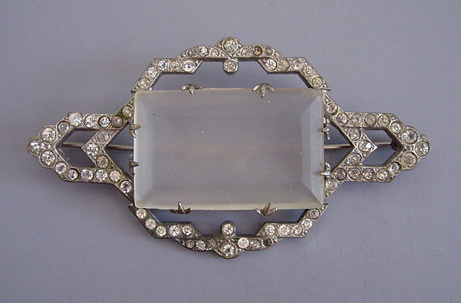 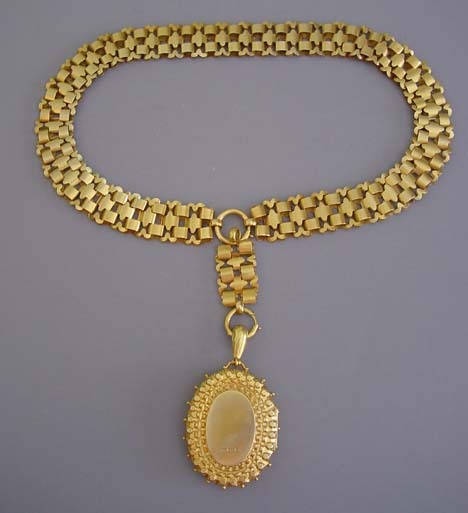 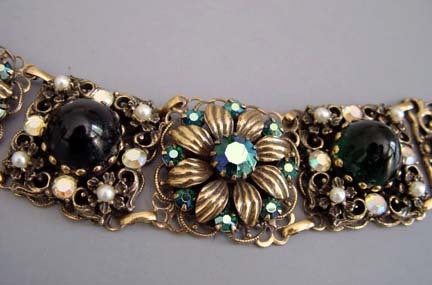 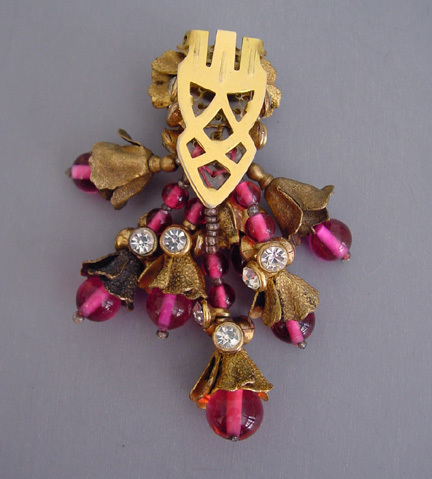 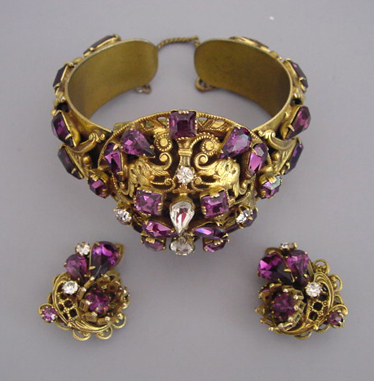 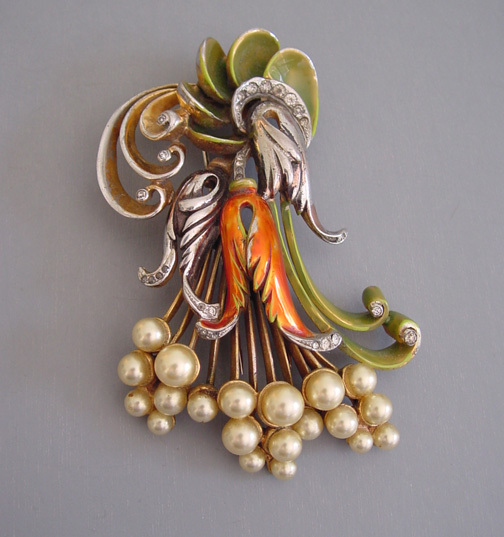 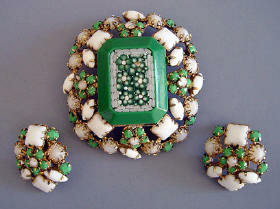 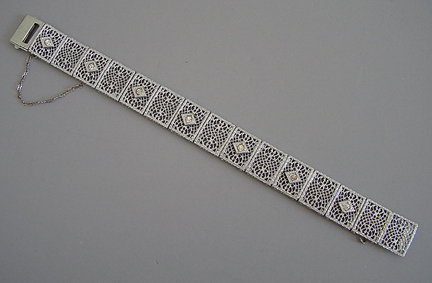 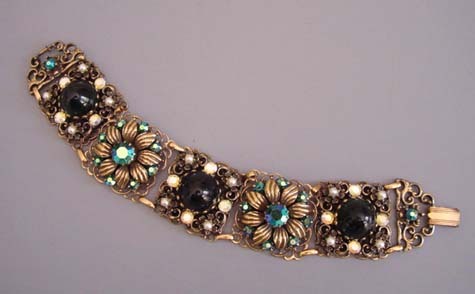 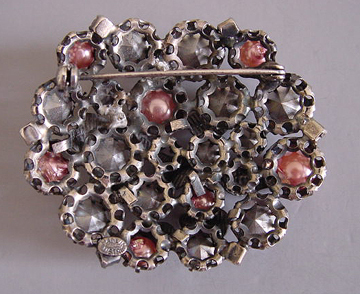 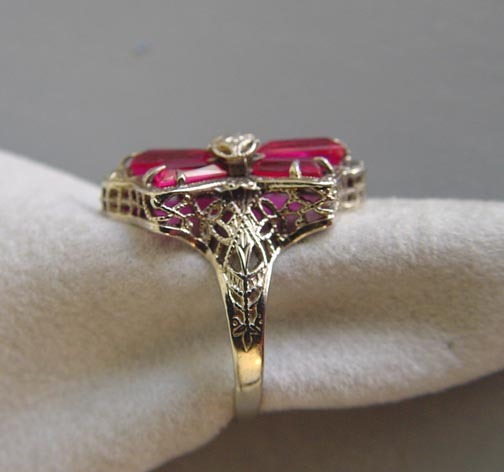 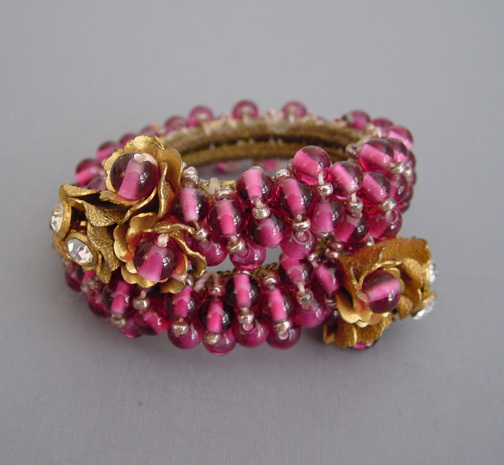 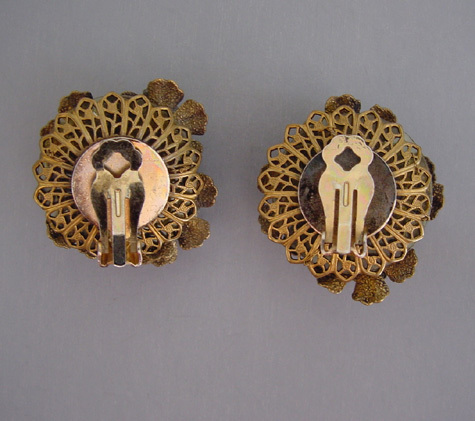 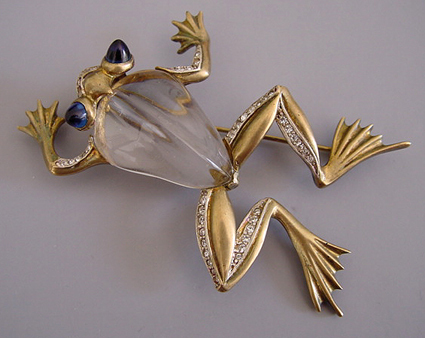 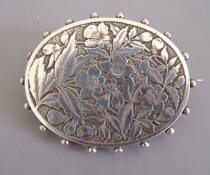 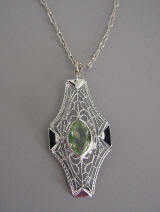 This filigree style continued and developed through the flapper era and into the 1930's. 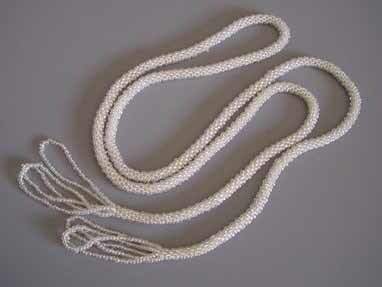 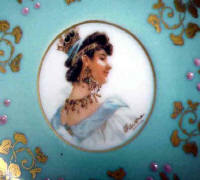 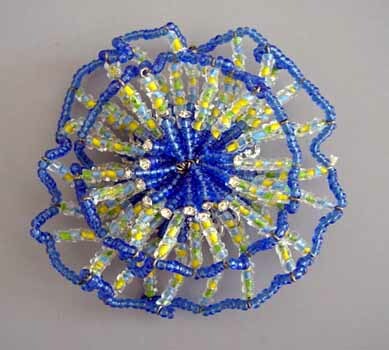 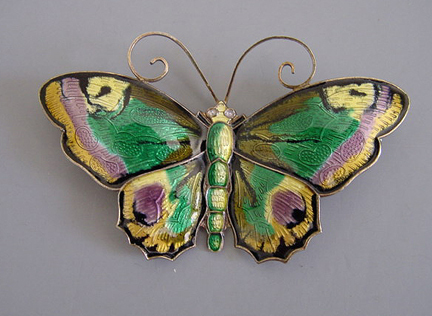 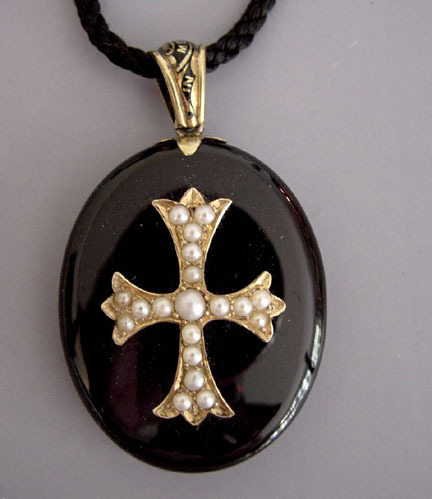 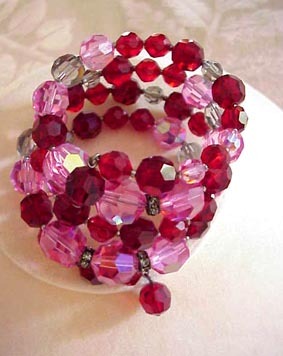 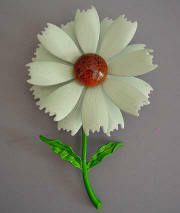 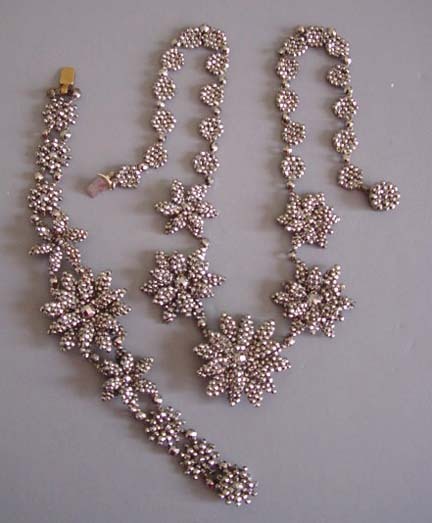 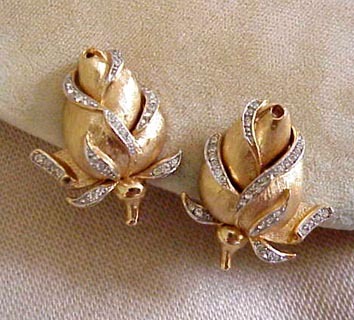 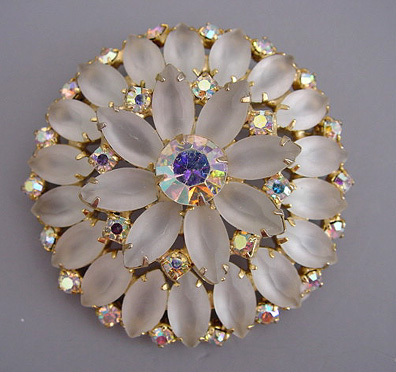 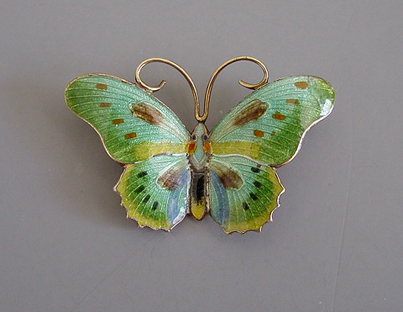 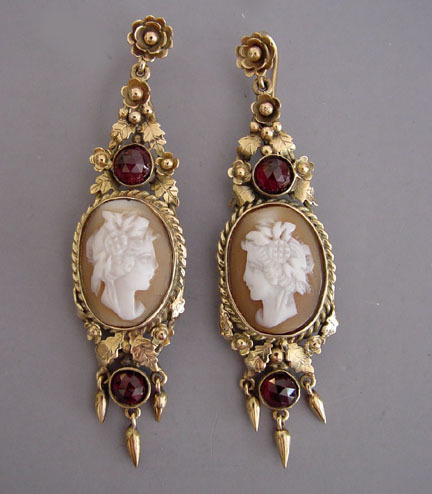 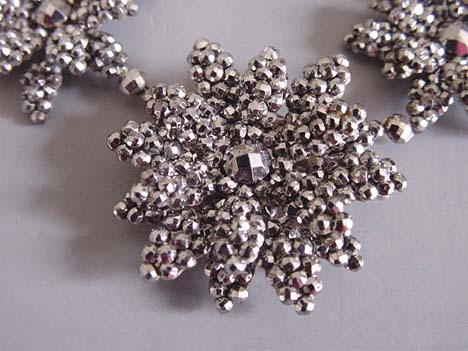 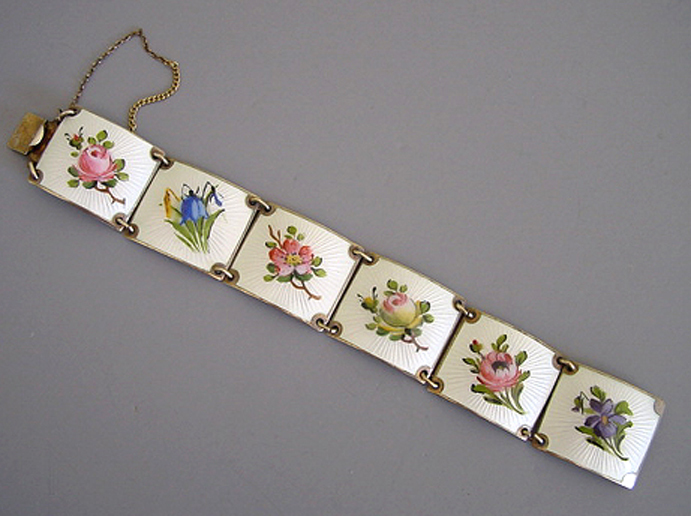 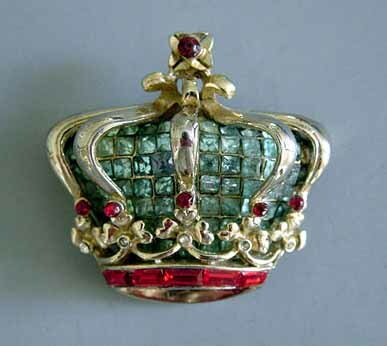 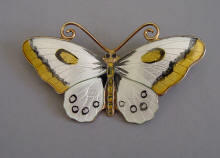 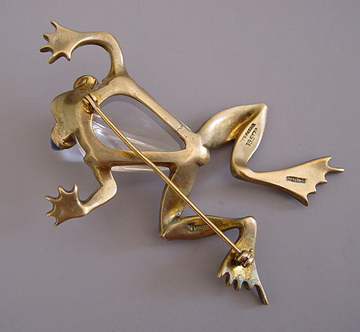 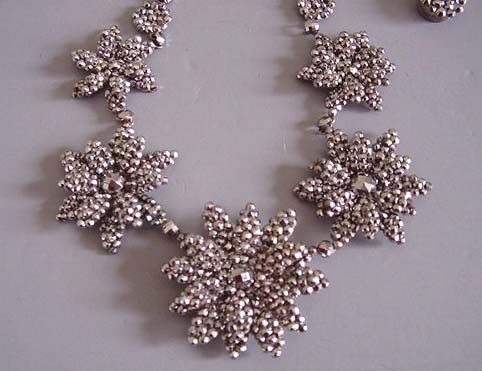 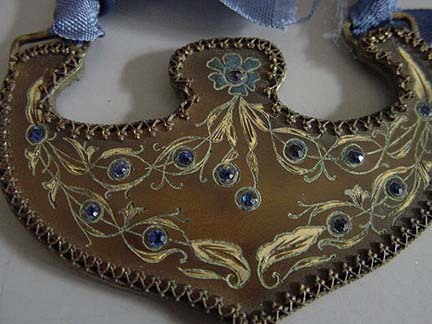 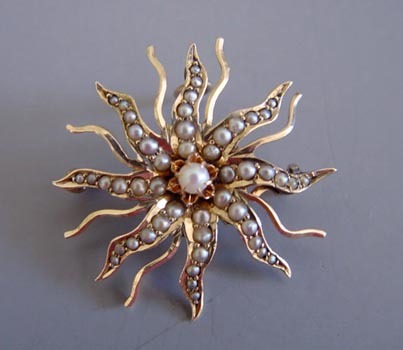 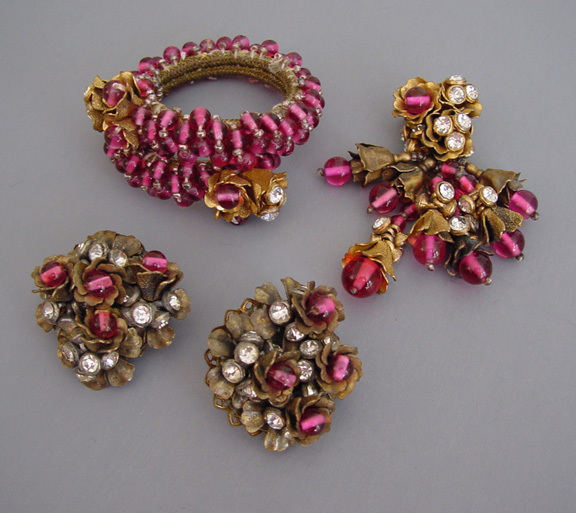 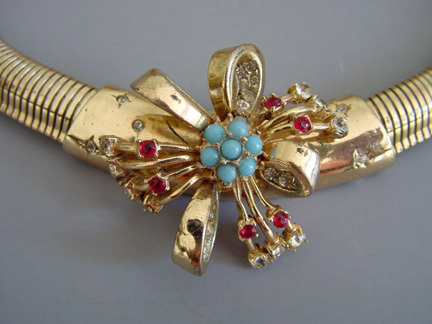 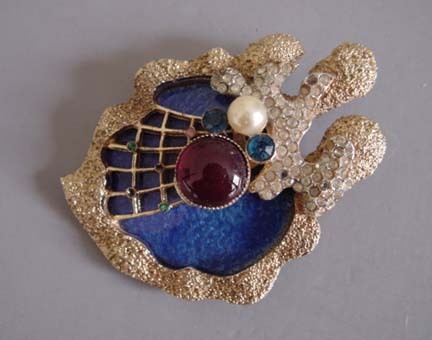 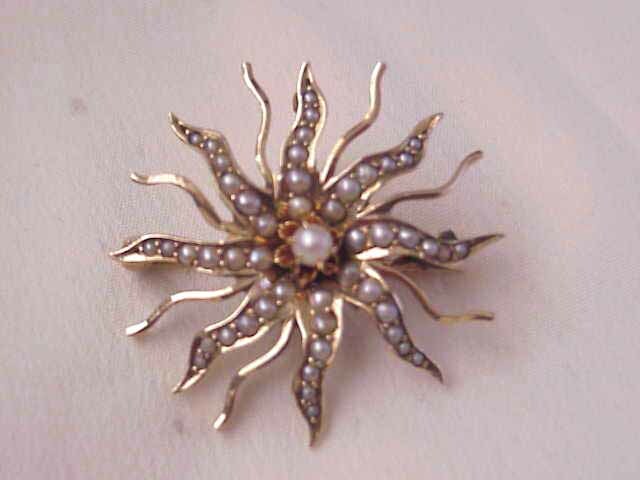 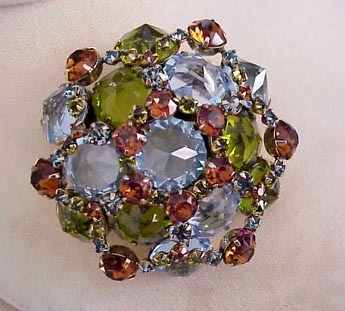 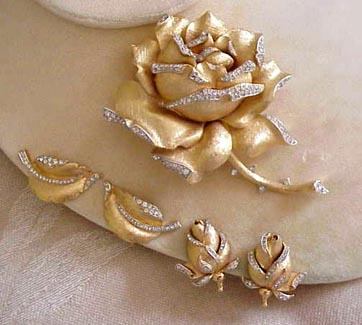 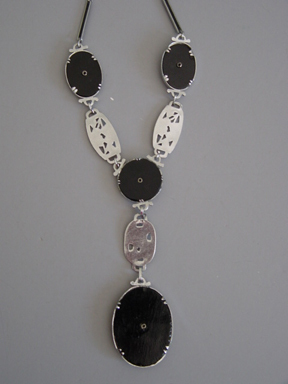 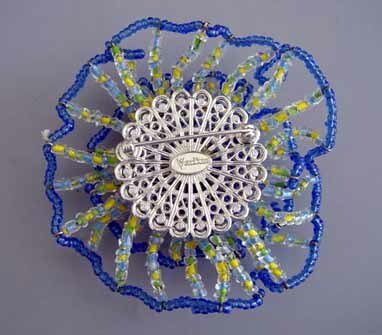 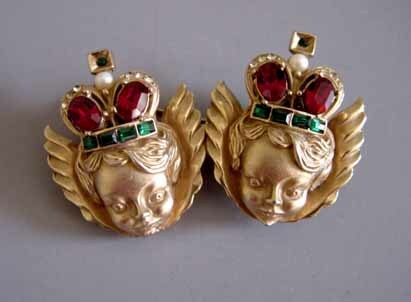 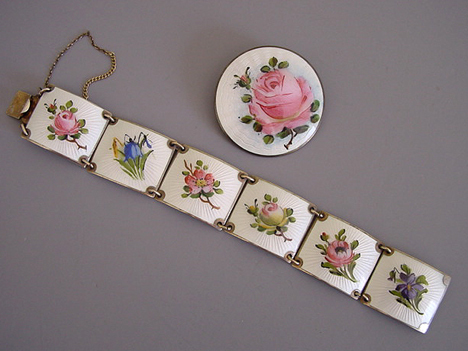 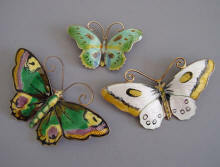 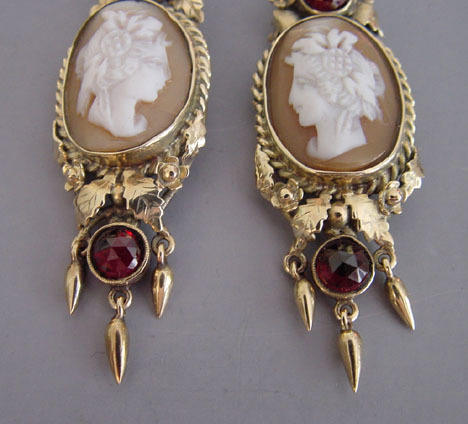 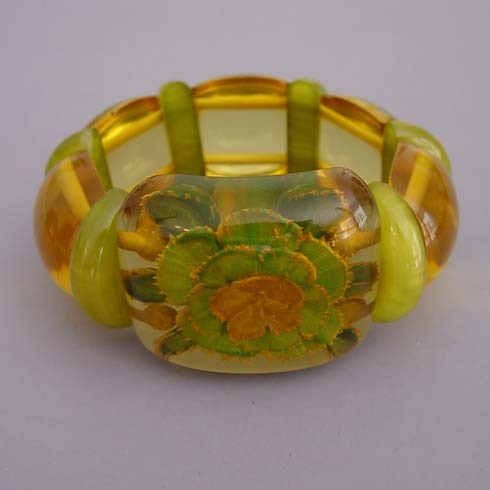 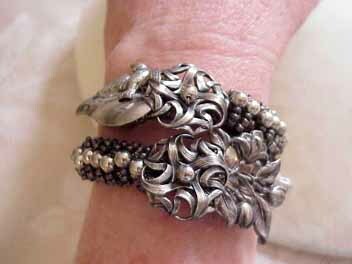 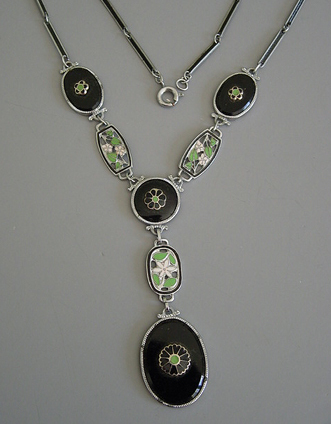 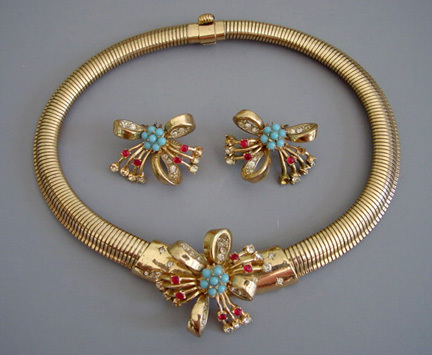 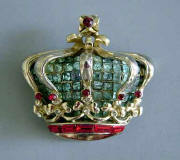 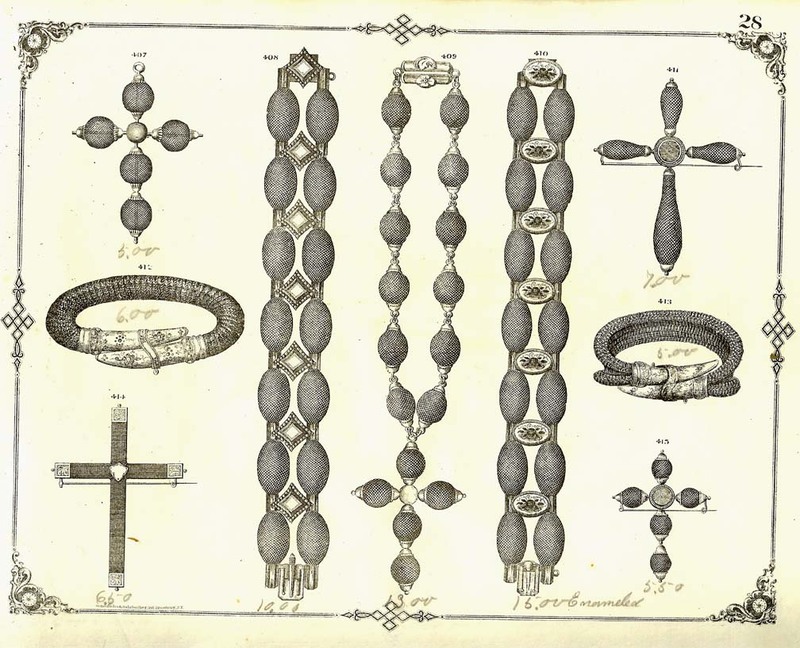 Sometimes they are plain filigree, and sometimes decorated with rhinestones and/or enameling. 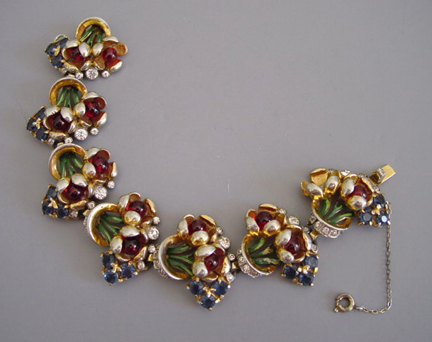 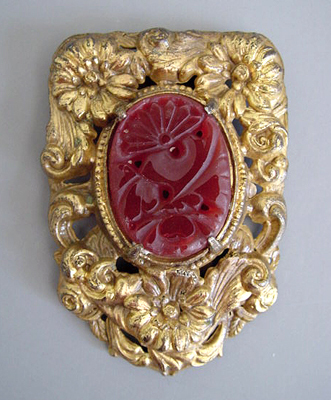 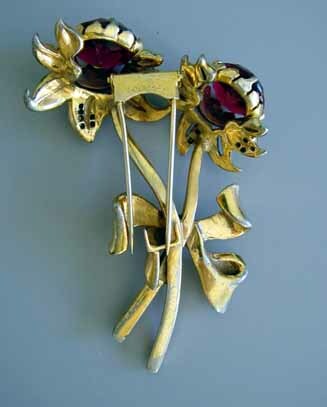 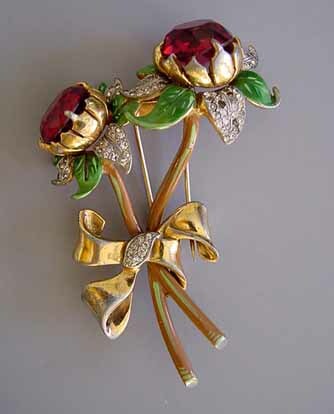 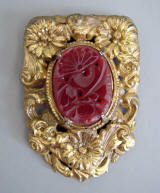 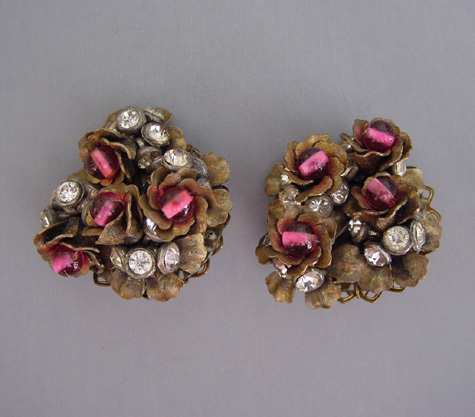 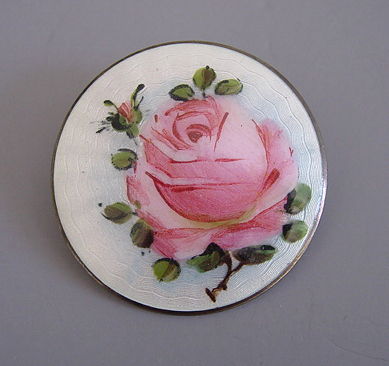 DeROSA red roses 3-1/8" clip with enameling and rhinestones. View View #d21162. 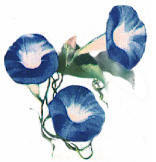 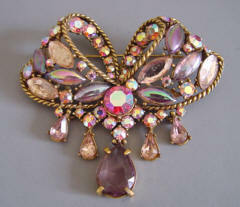 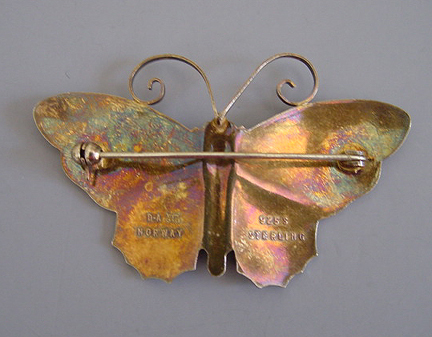 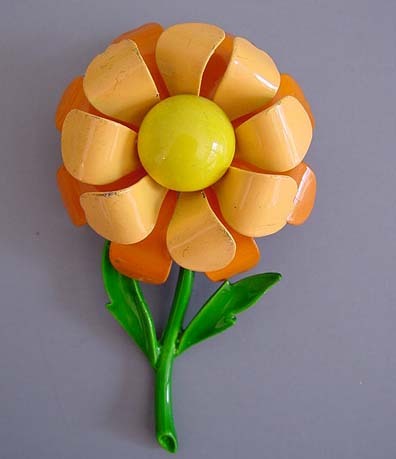 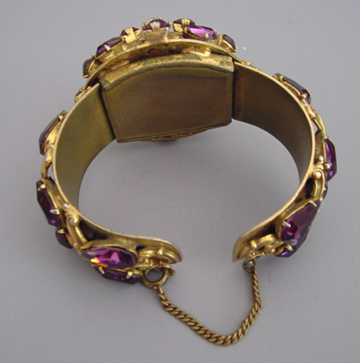 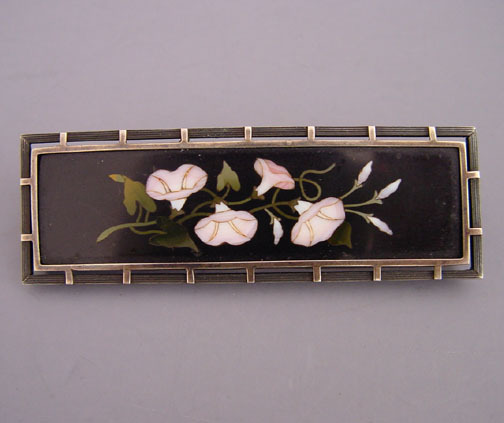 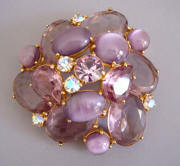 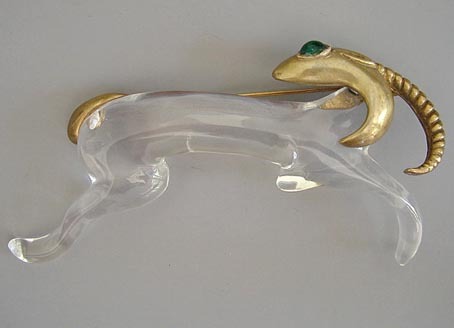 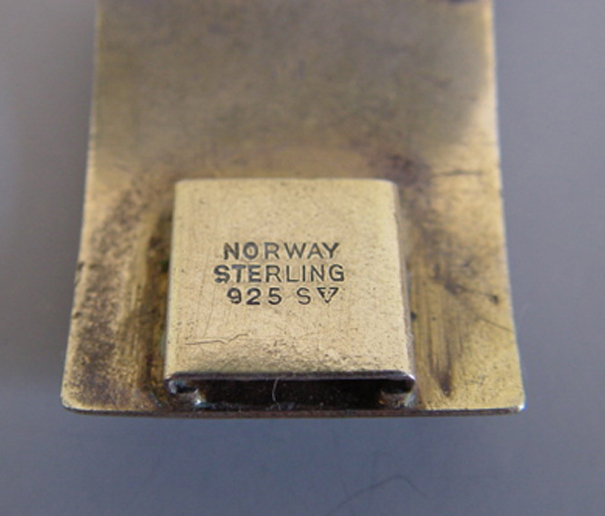 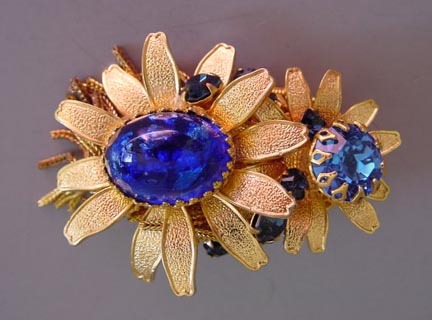 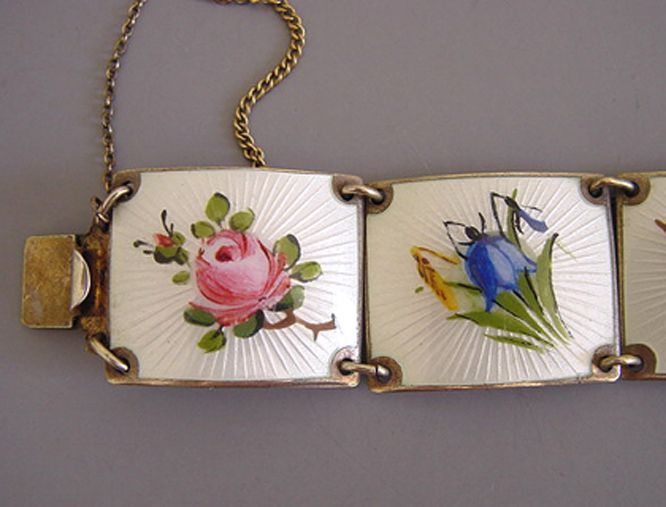 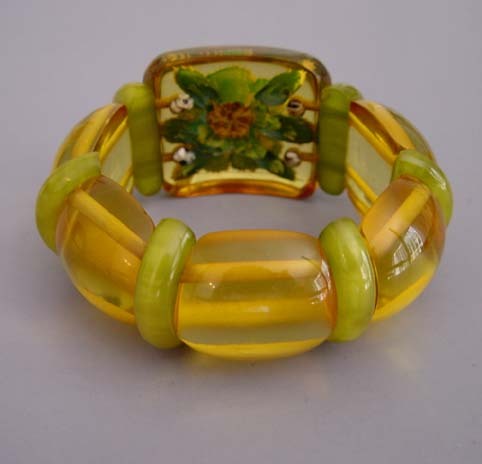 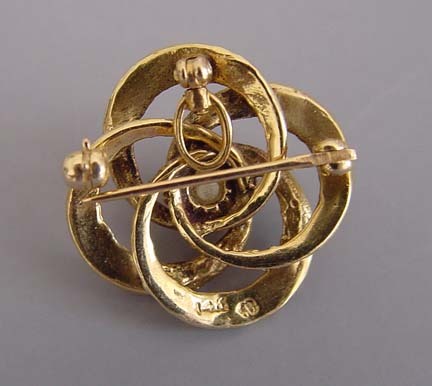 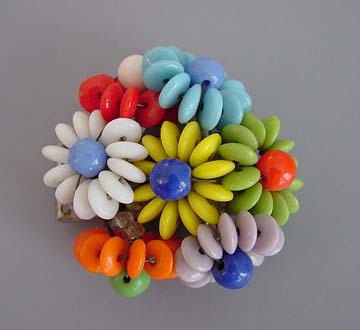 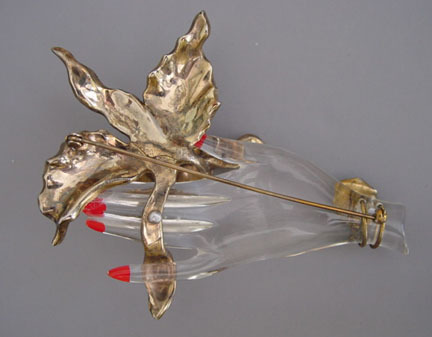 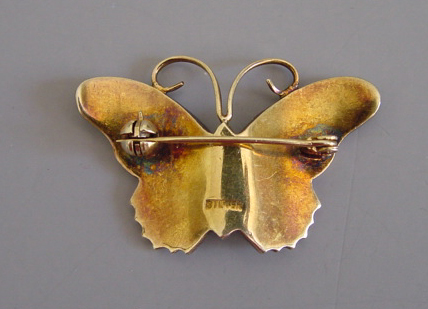 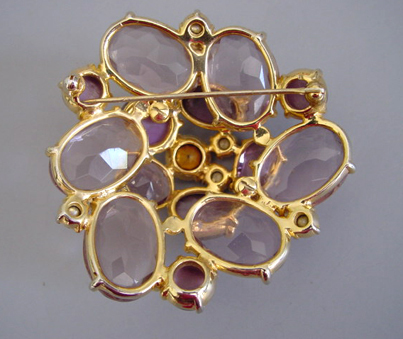 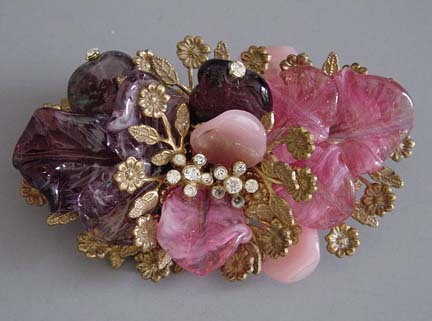 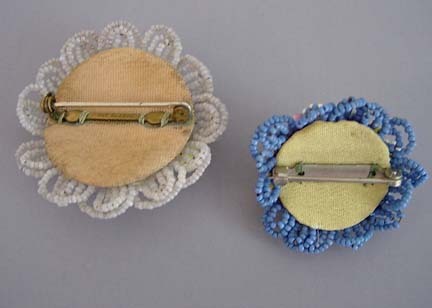 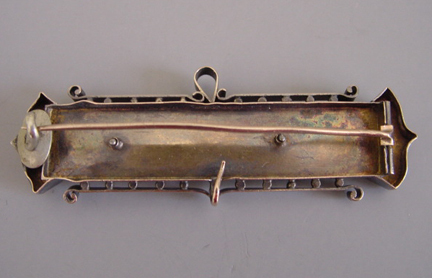 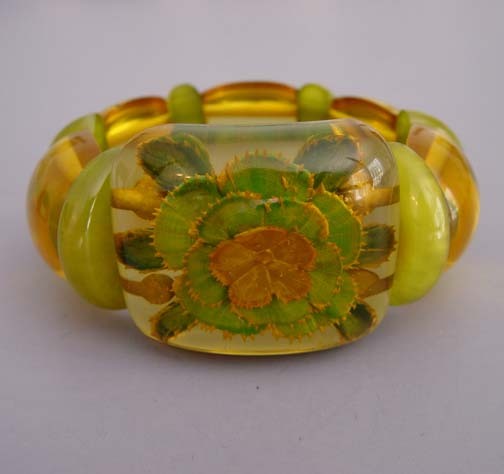 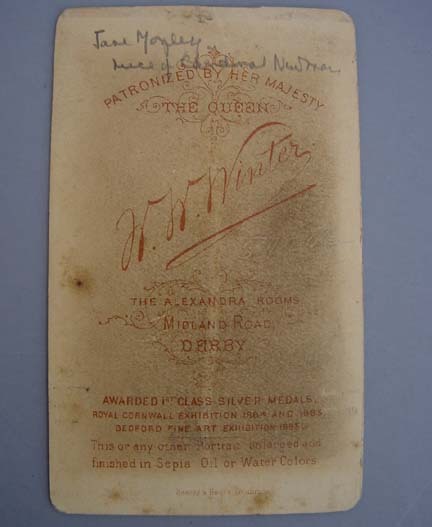 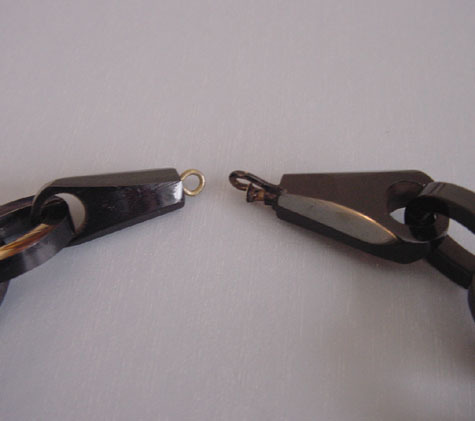 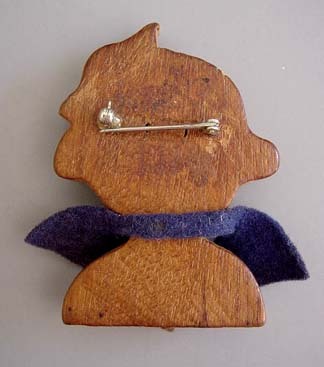 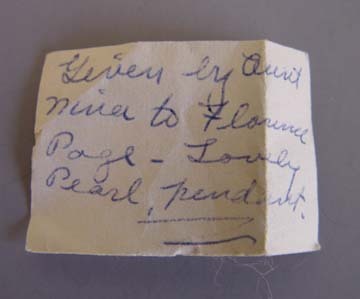 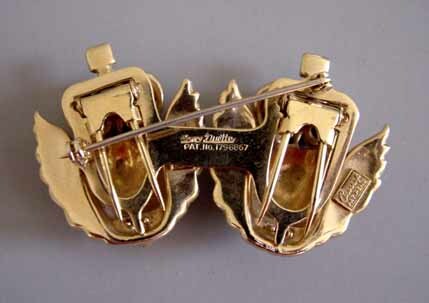 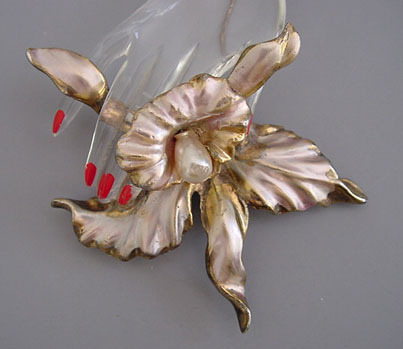 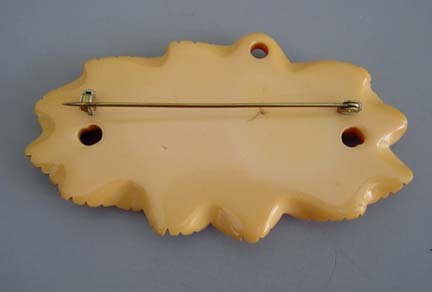 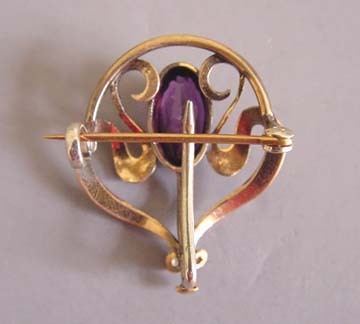 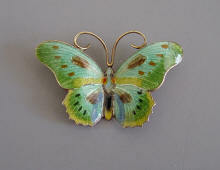 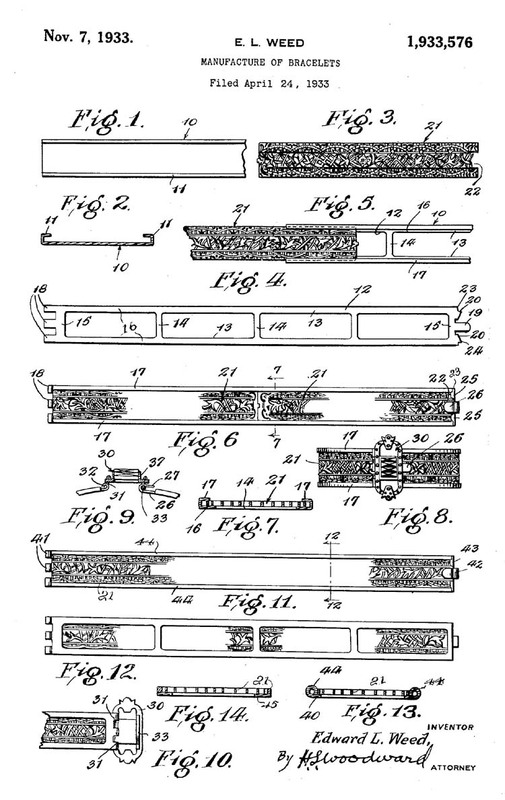 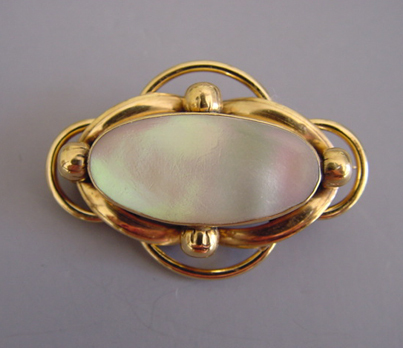 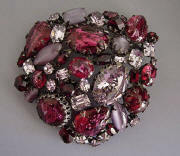 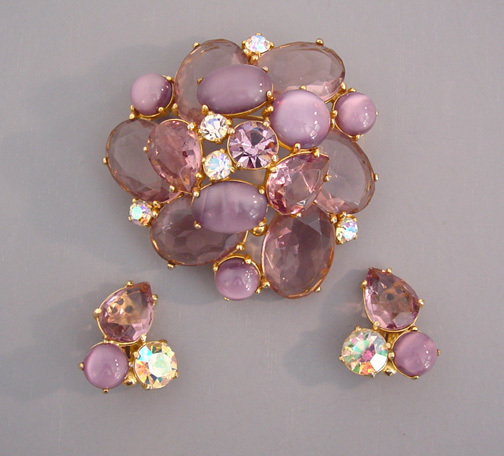 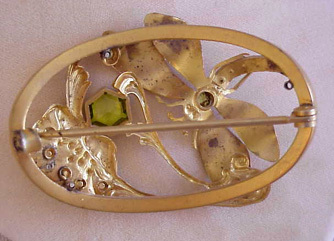 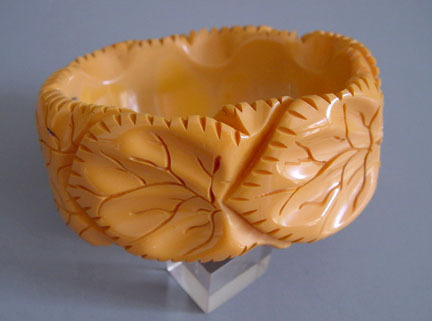 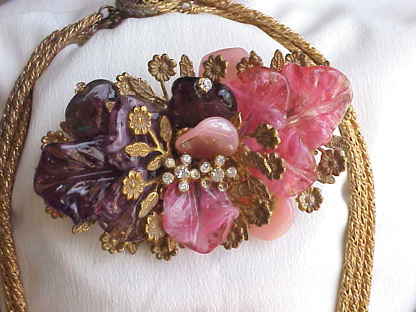 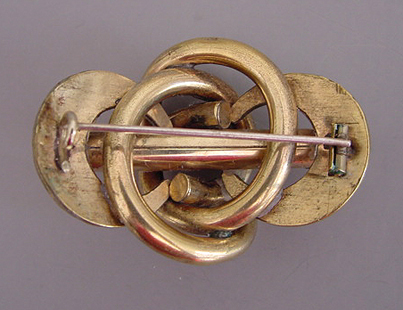 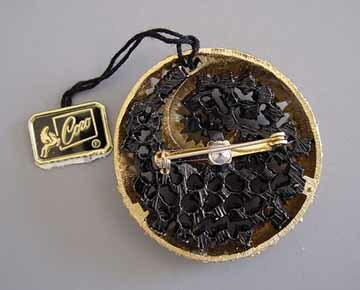 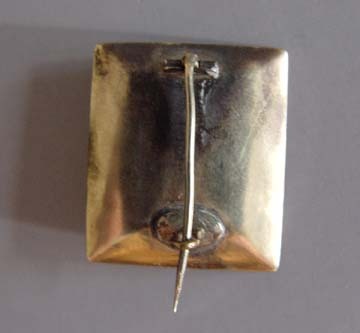 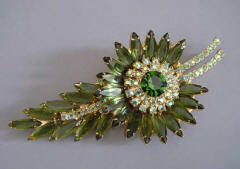 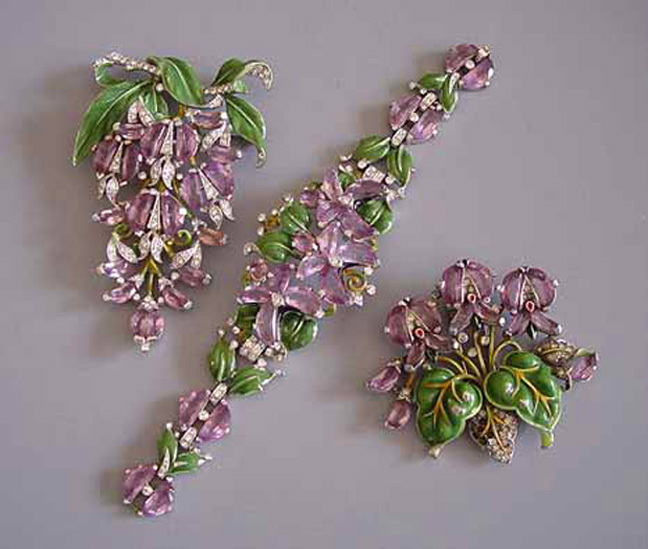 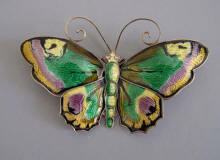 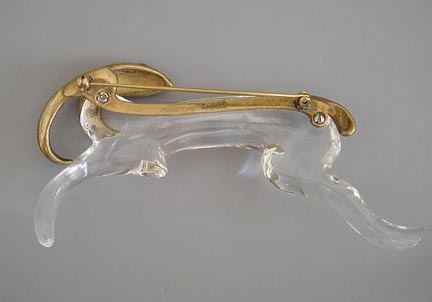 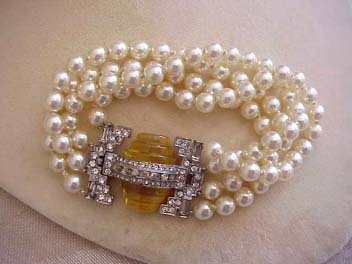 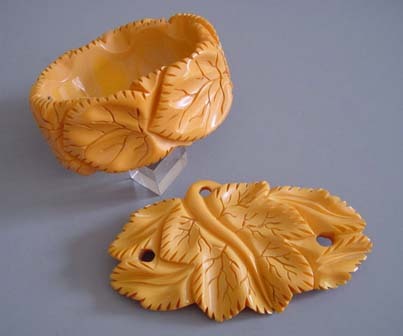 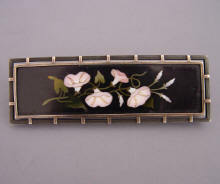 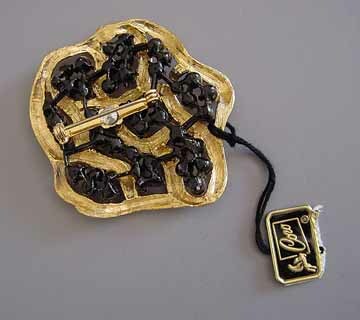 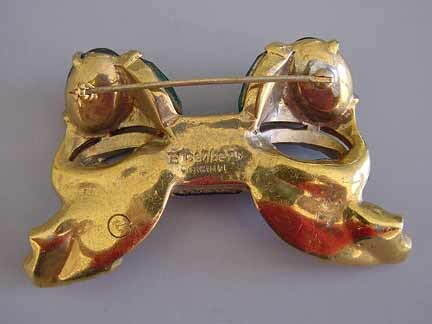 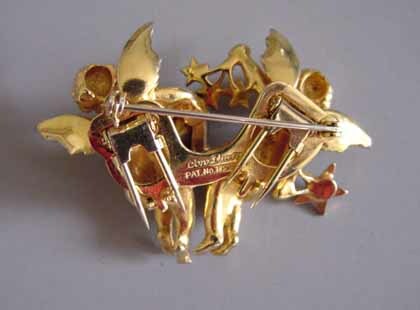 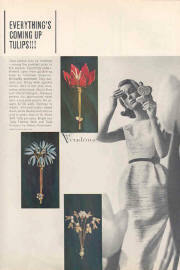 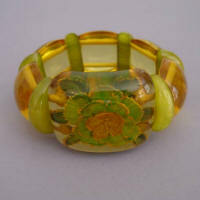 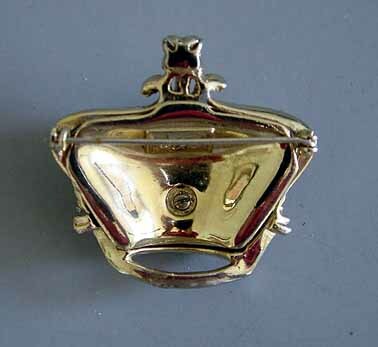 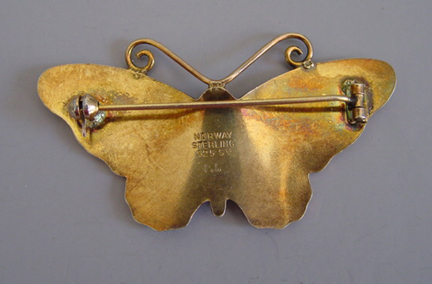 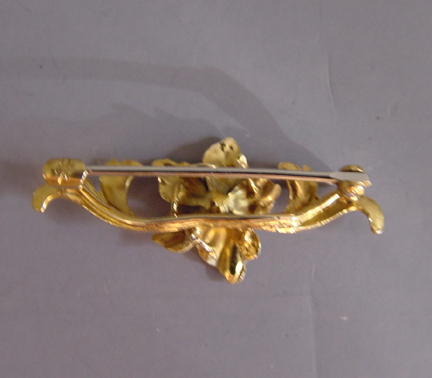 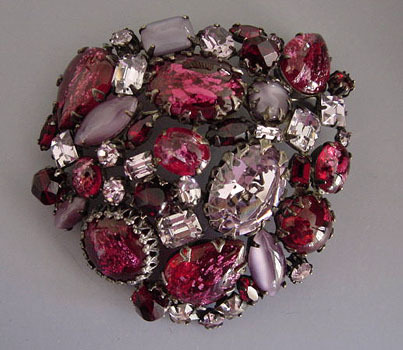 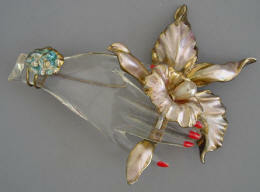 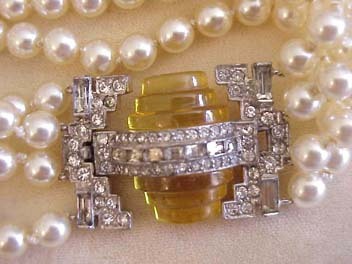 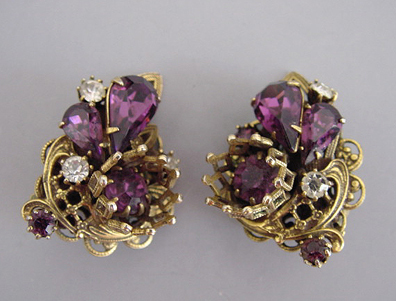 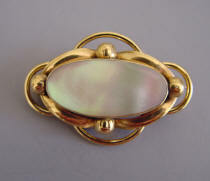 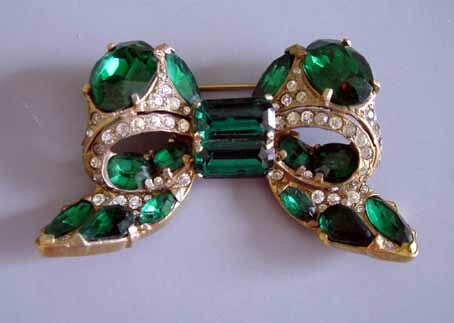 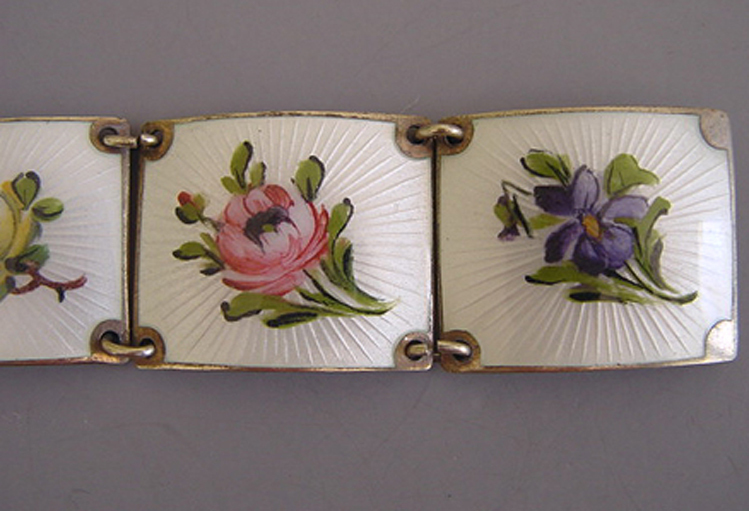 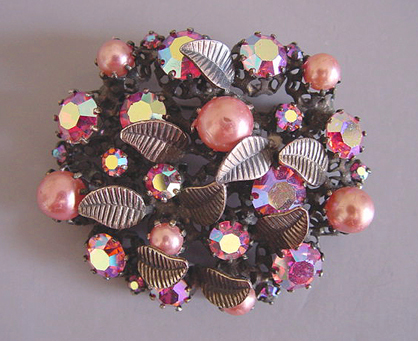 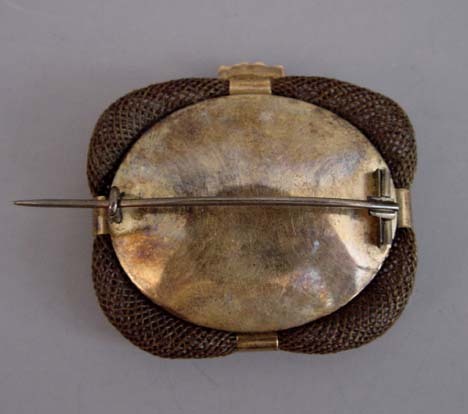 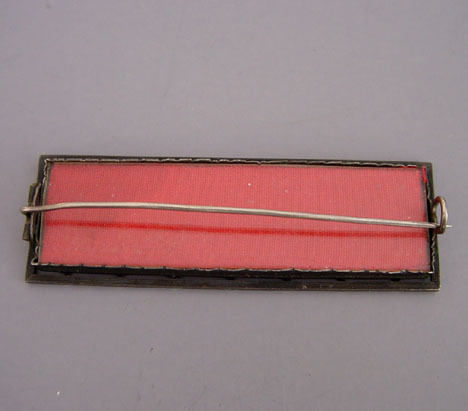 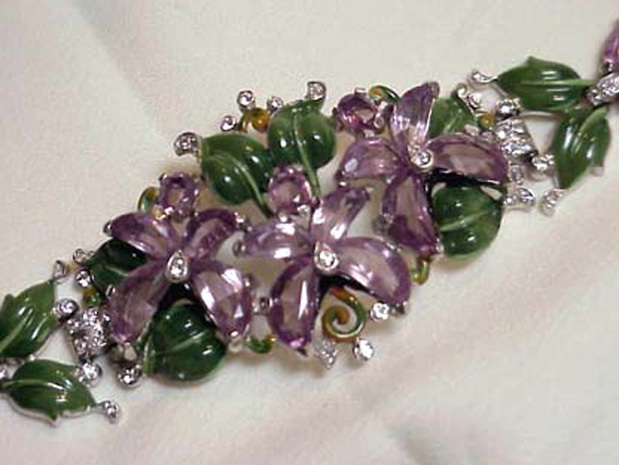 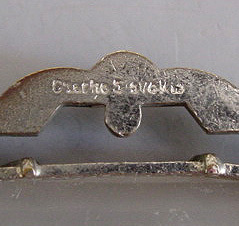 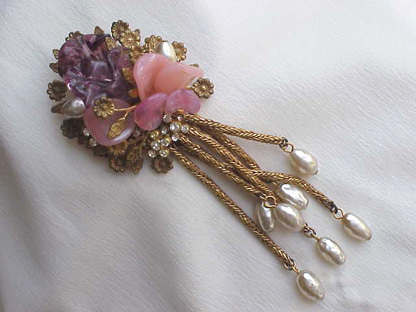 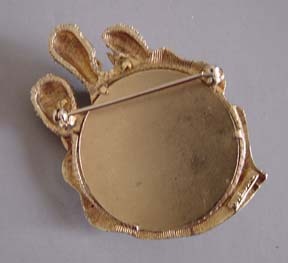 and violets fur clip, patent number 131,887 from March 1942. 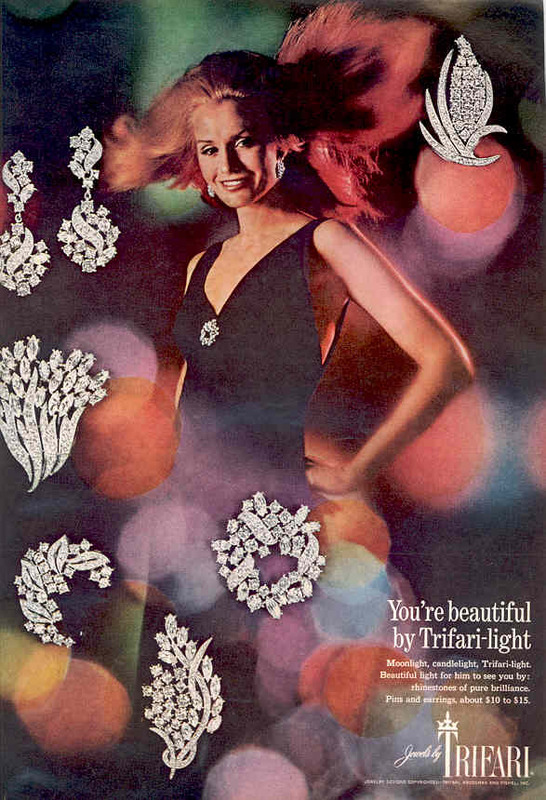 #T21205. 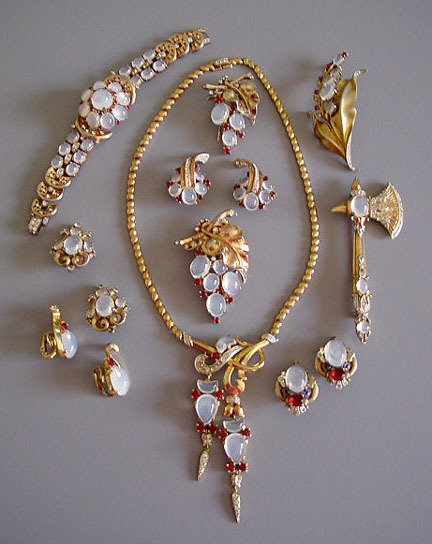 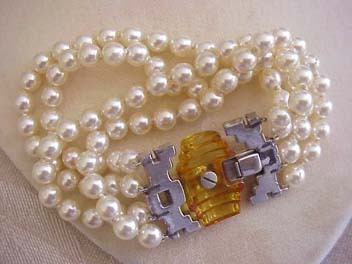 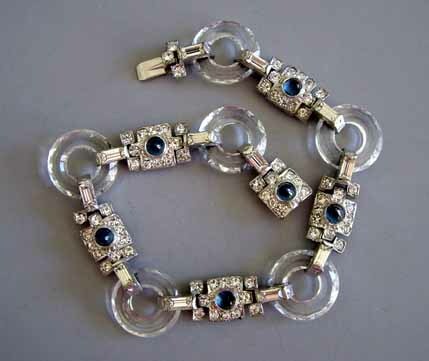 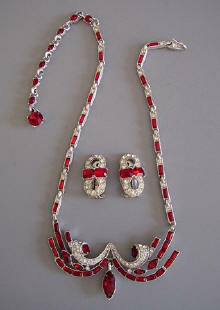 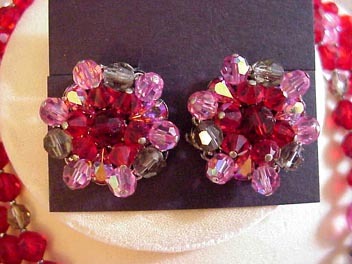 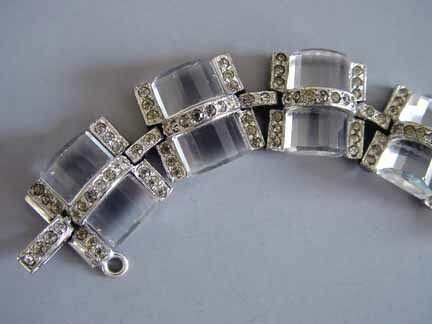 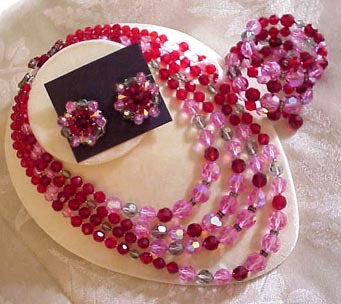 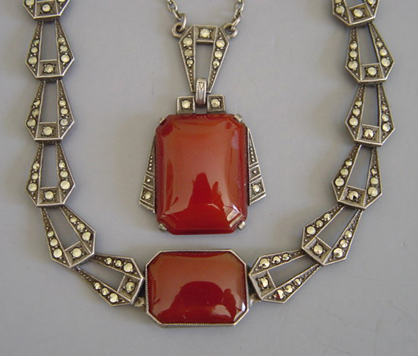 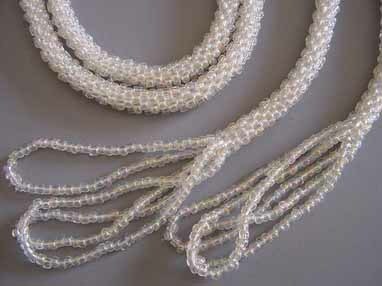 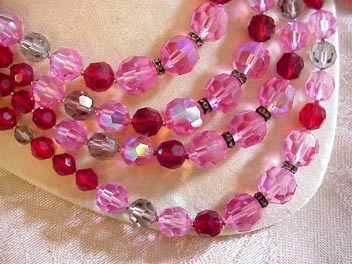 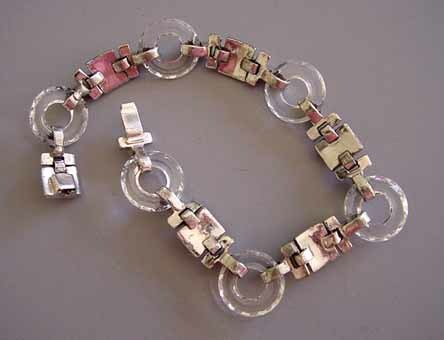 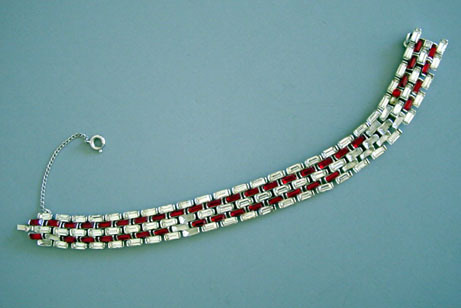 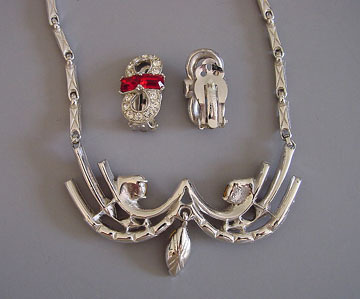 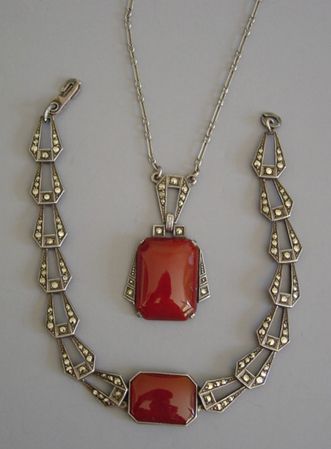 Backs TRIFARI faux moonstones clear and red rhinestones jewelry. 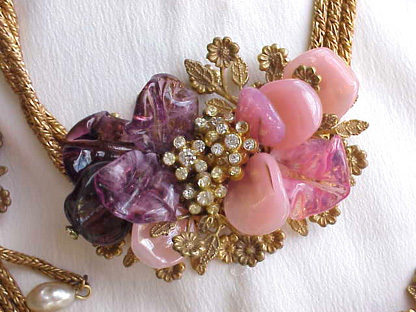 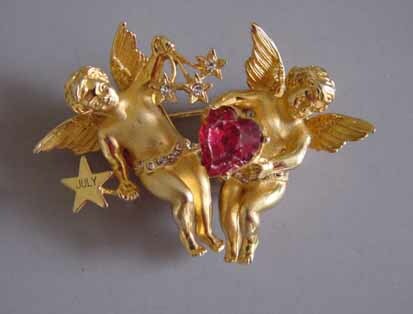 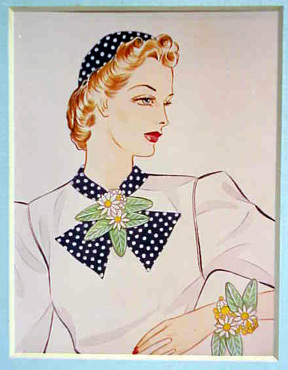 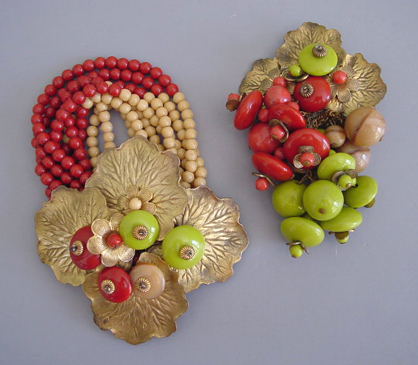 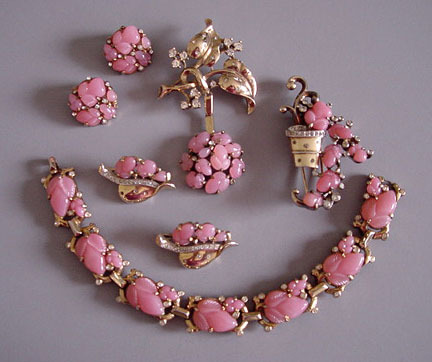 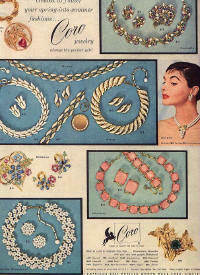 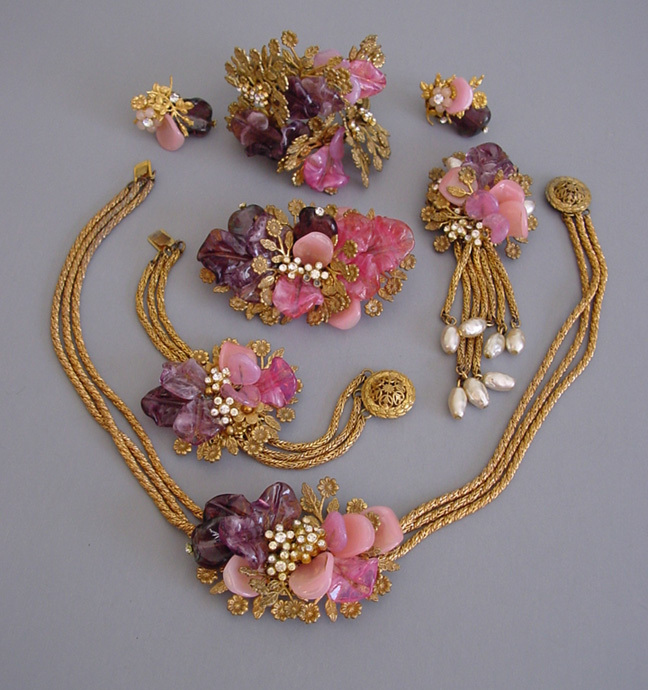 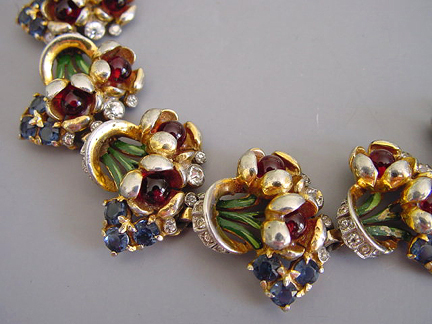 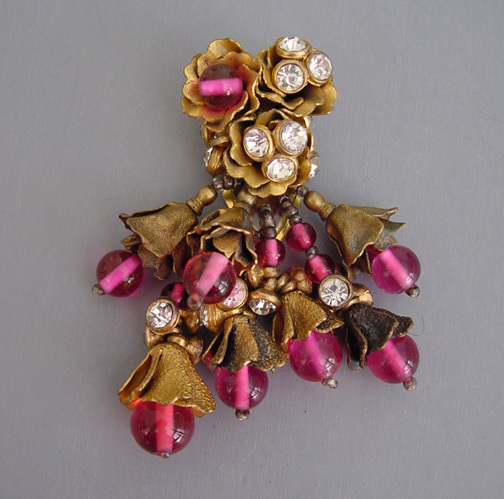 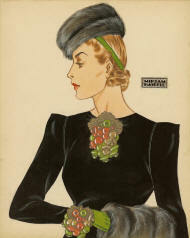 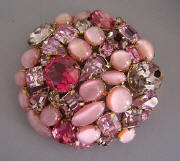 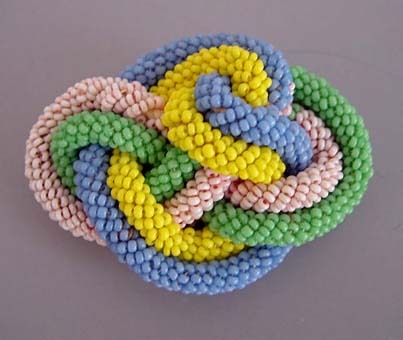 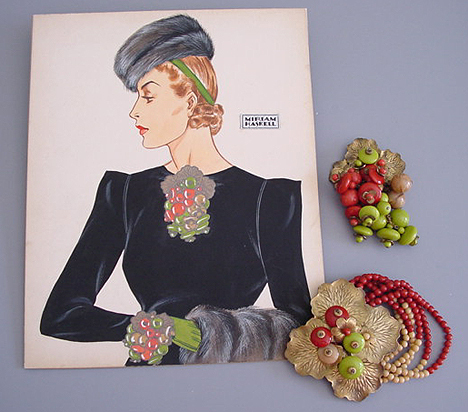 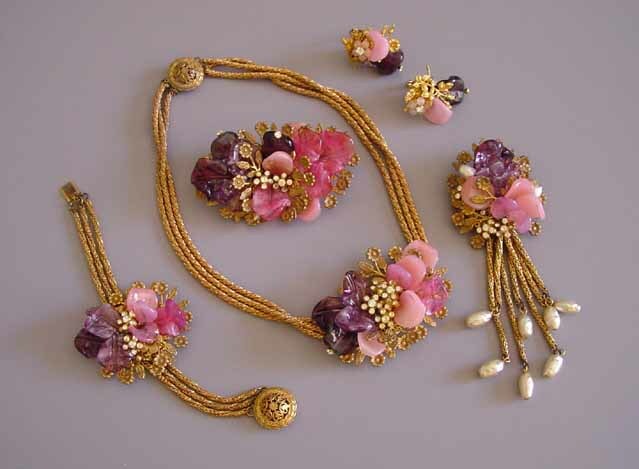 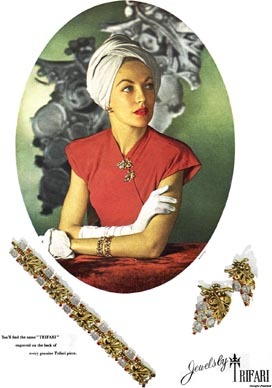 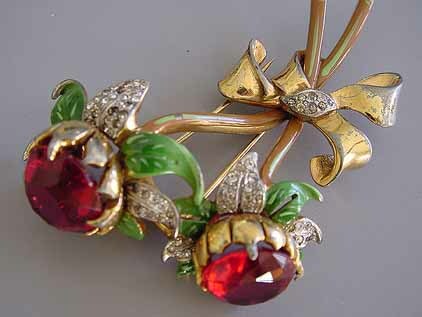 View View 1945 Ad TRIFARI pink fruit salad parure. 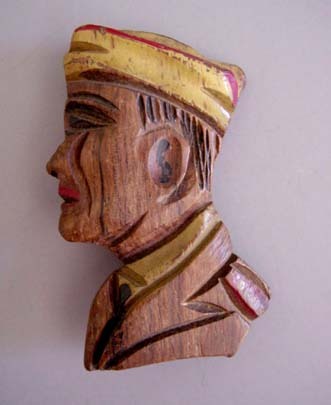 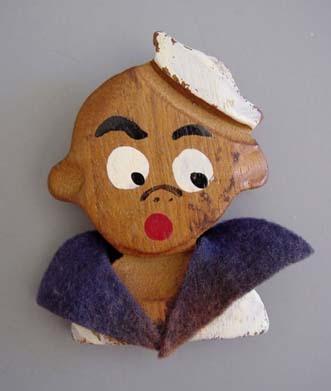 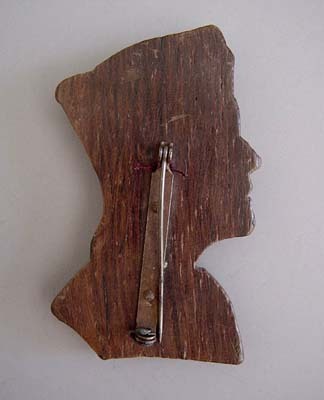 Hand decorated, possibly from a home crafts kit, this solider combines wood, felt and painted details. 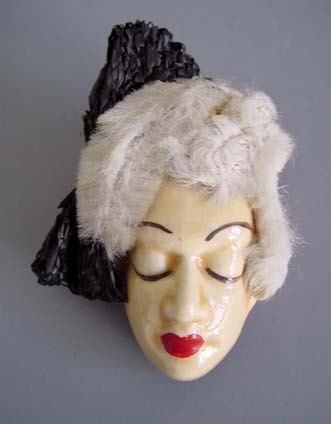 Ceramic faces were cast and then decorated individually with various hats and hairdos made of felt, fabric, straw and pipe cleaners. 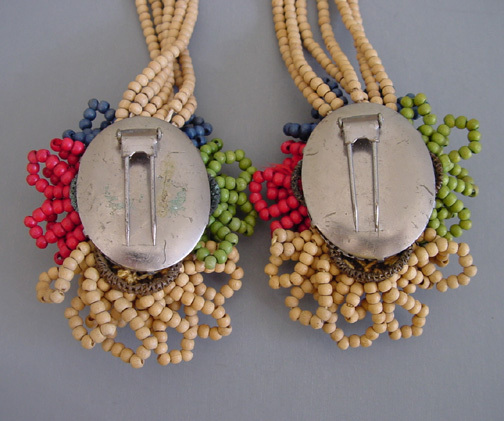 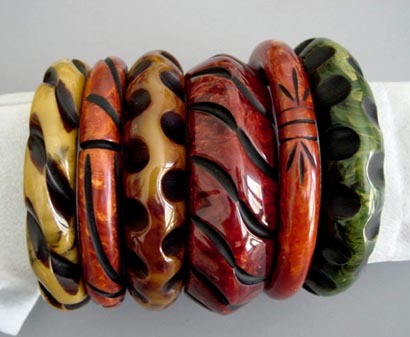 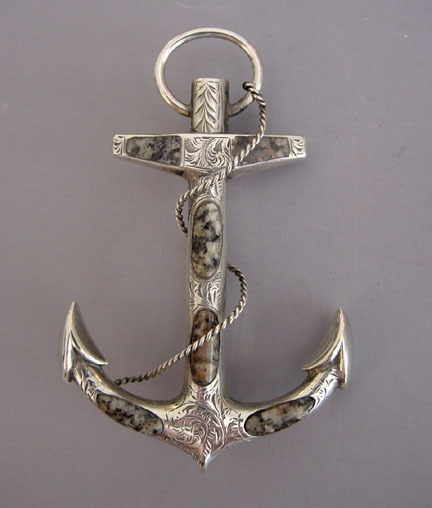 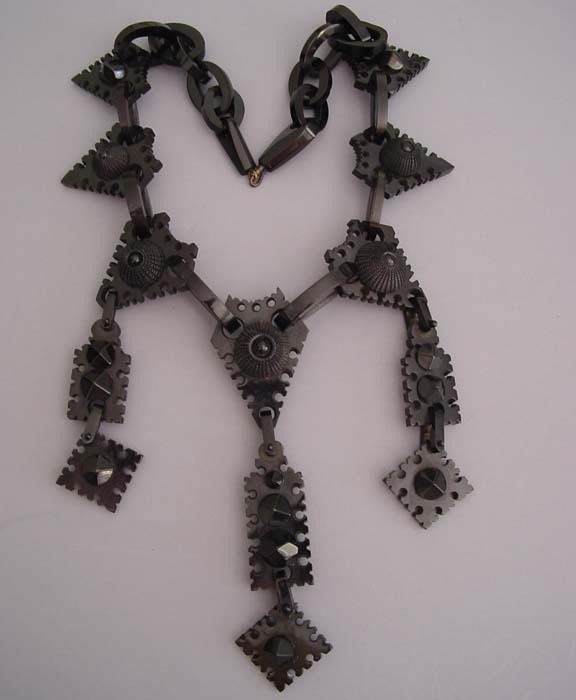 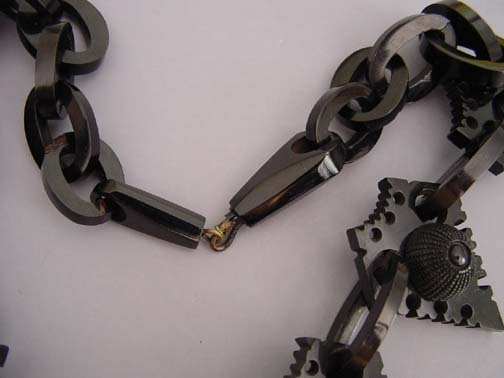 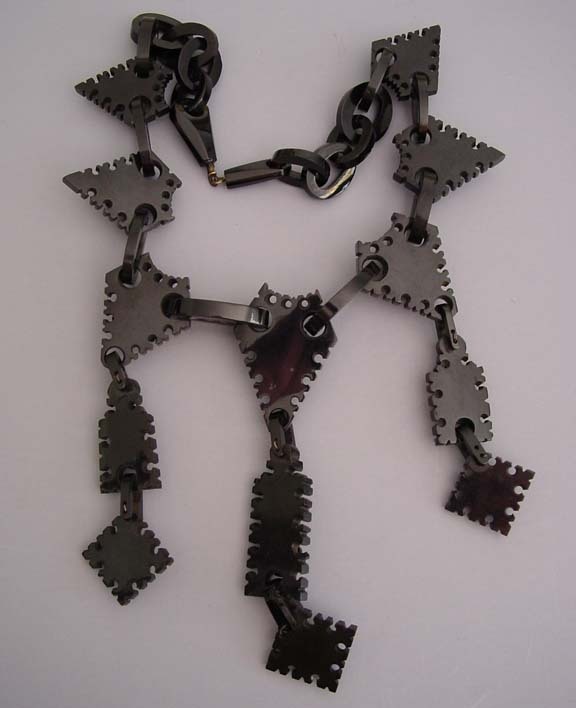 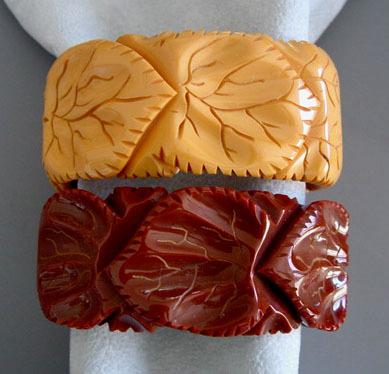 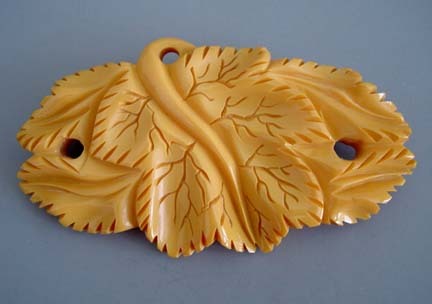 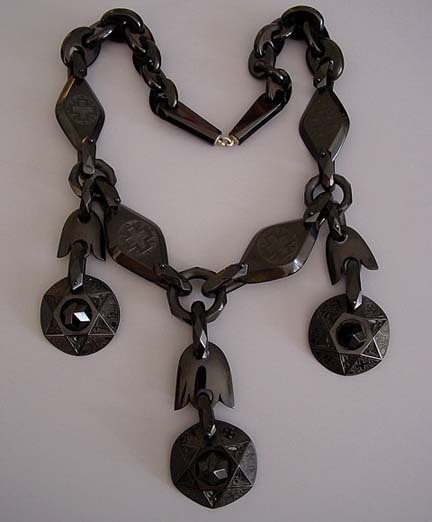 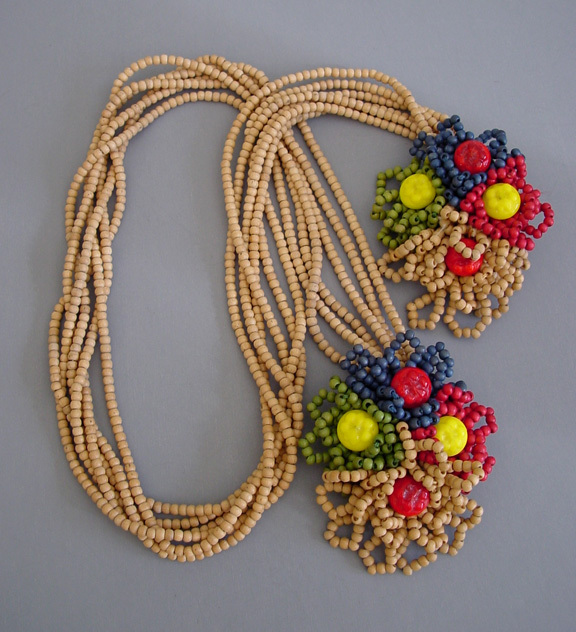 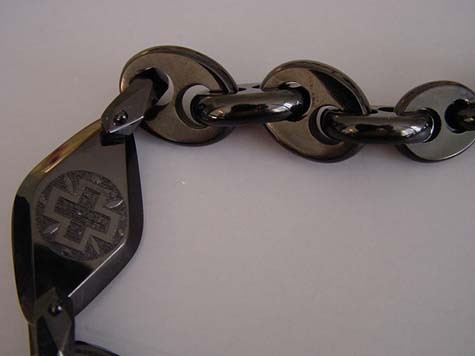 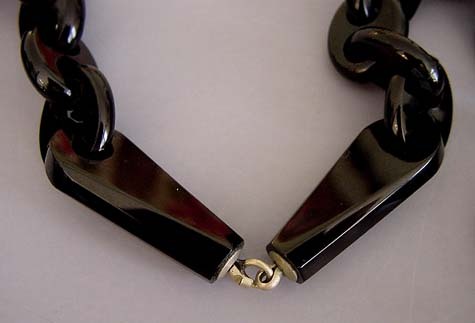 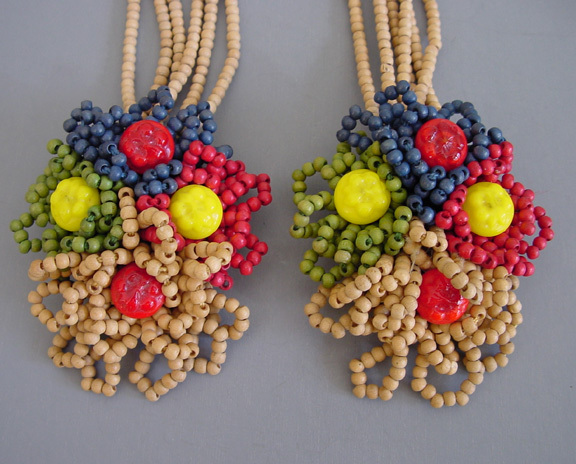 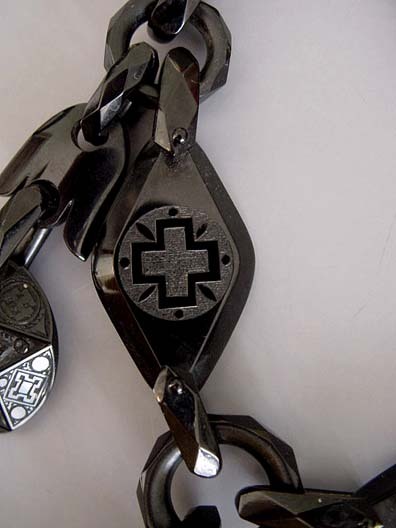 Hand carved and paint details give each piece of wooden jewelry a unique character. 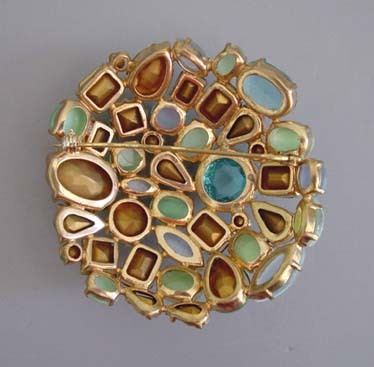 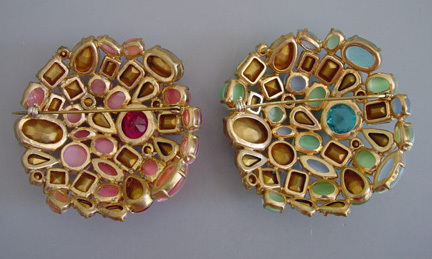 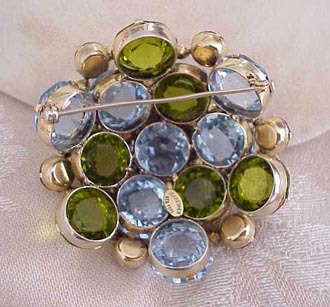 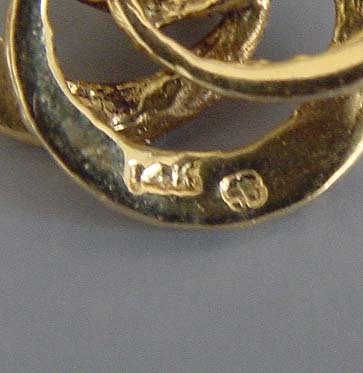 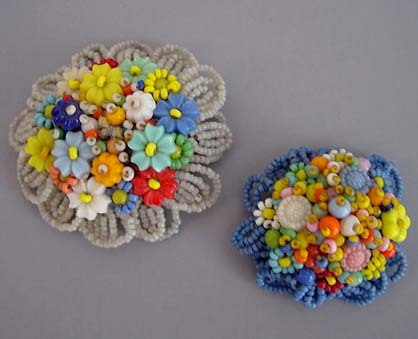 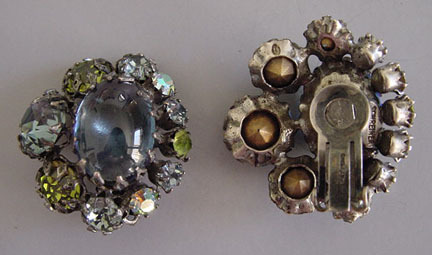 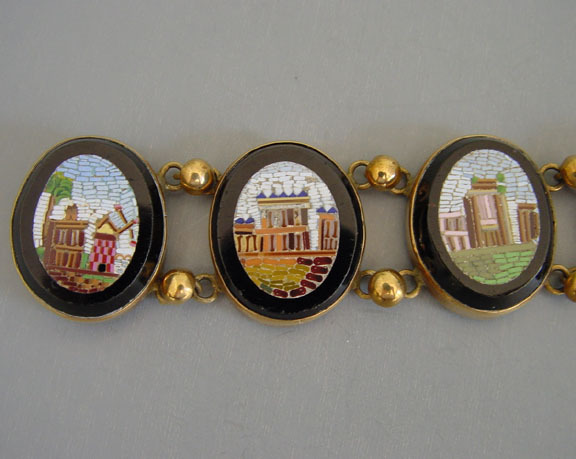 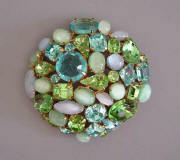 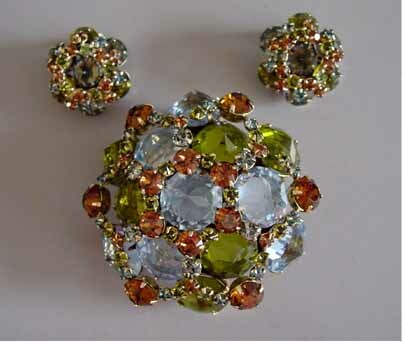 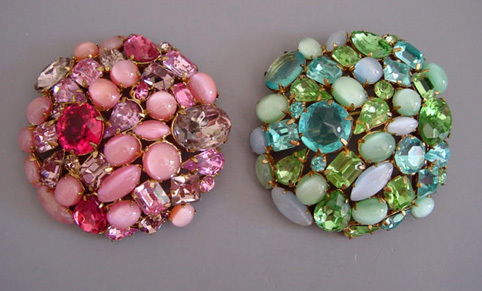 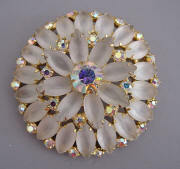 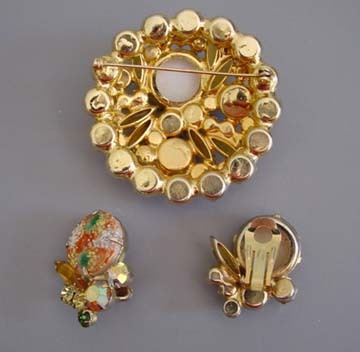 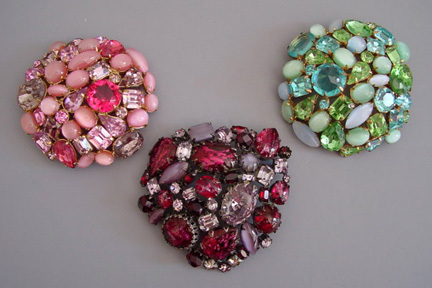 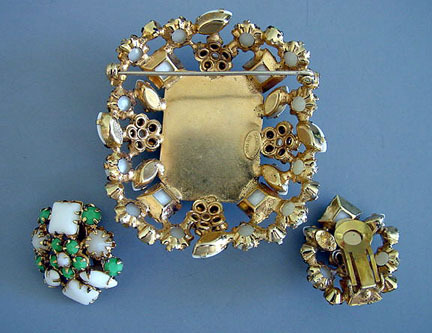 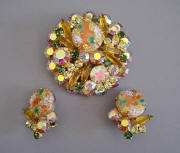 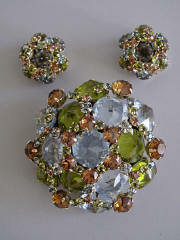 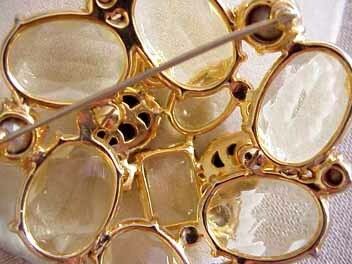 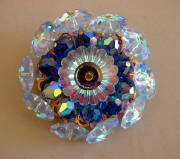 "Jewelled "buttons. 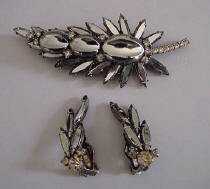 Two pins $35.00 each, Necklace,$60.00. Elongated fake pearl earrings $20.00. 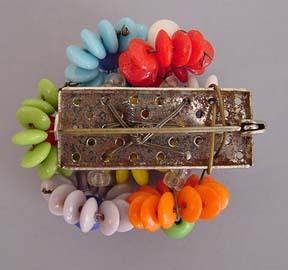 All by Miriam Haskell. 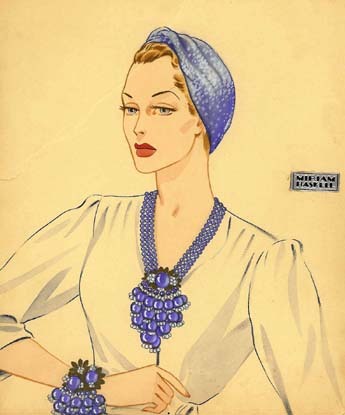 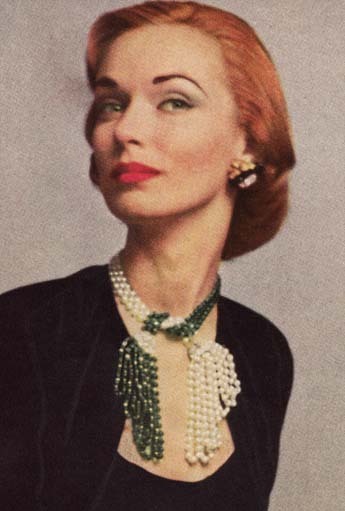 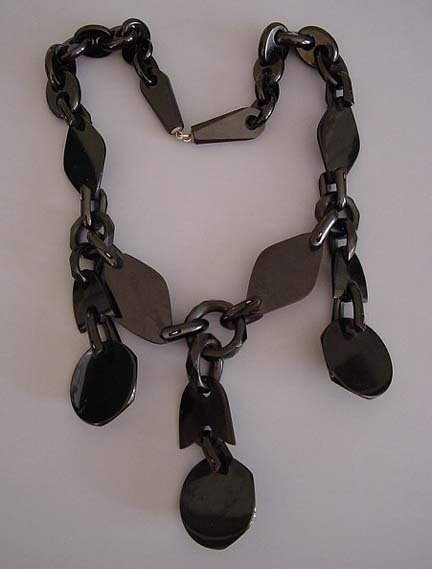 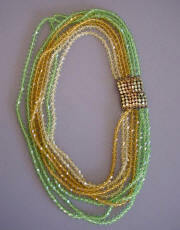 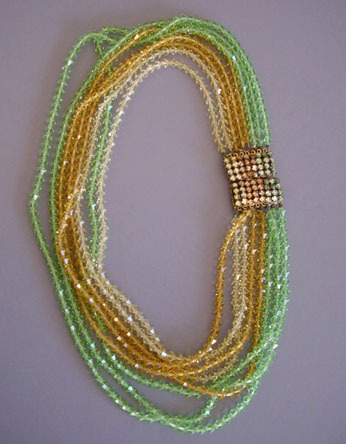 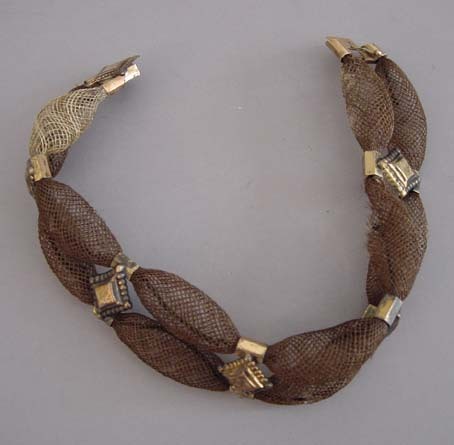 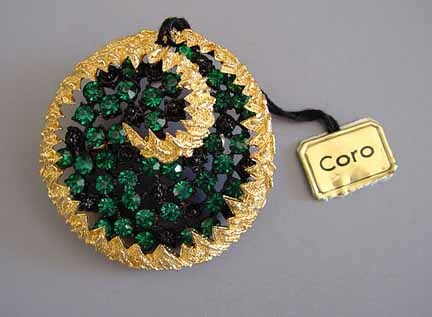 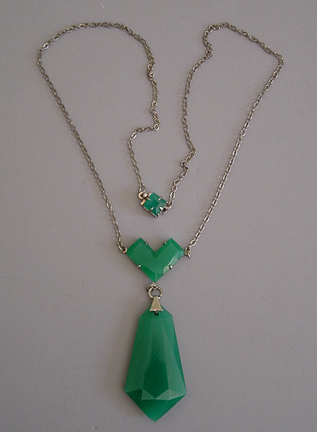 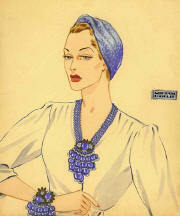 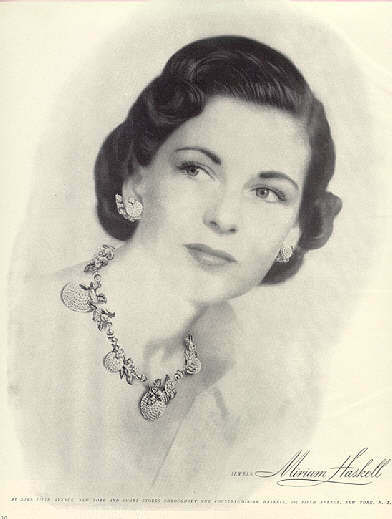 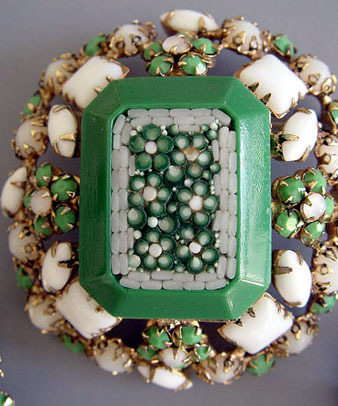 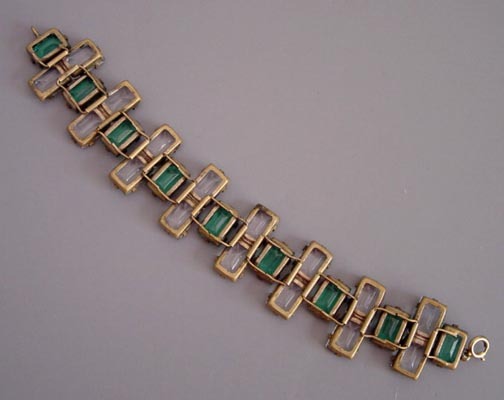 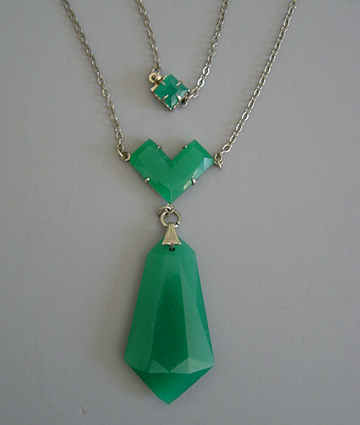 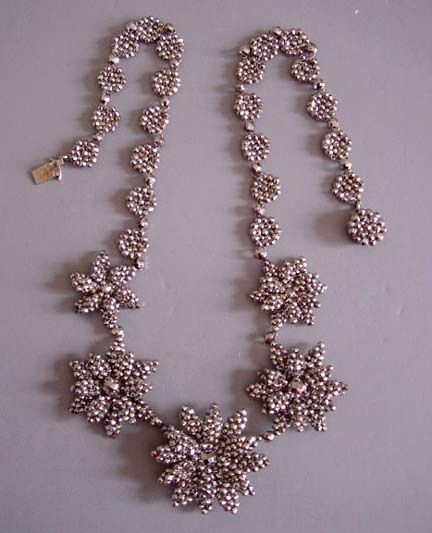 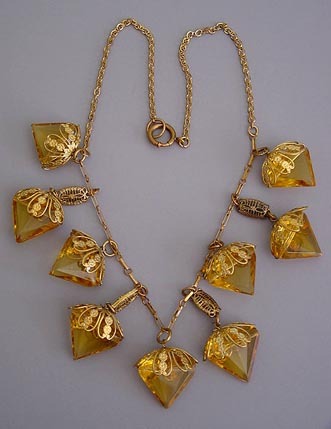 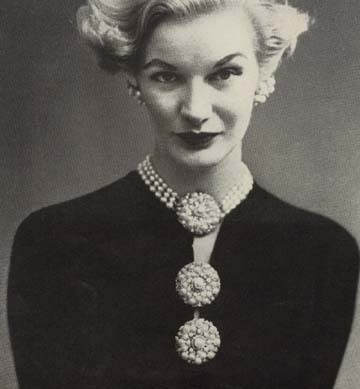 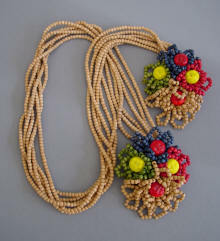 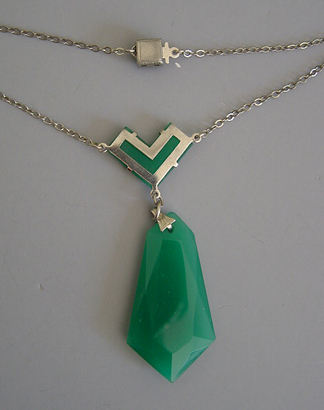 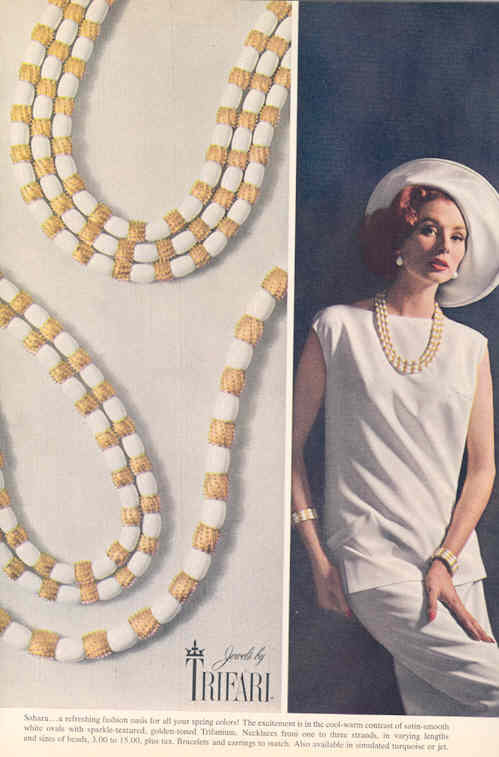 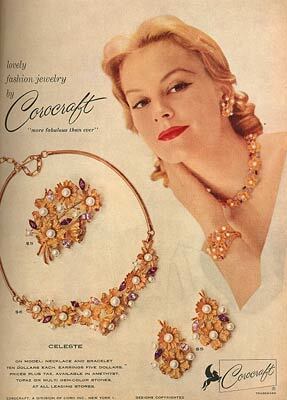 Saks Fifth Ave. COROCRAFT "Celeste"
Vogue 1951 HASKELL green glass beads and artificial pearls necklace. 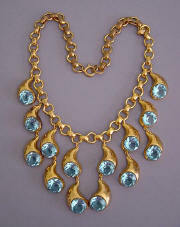 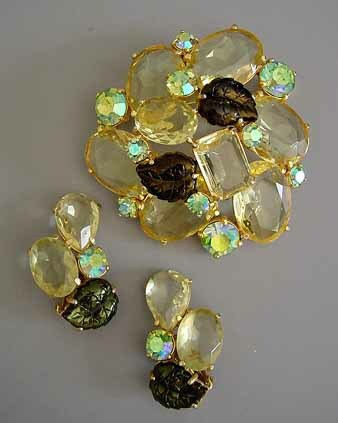 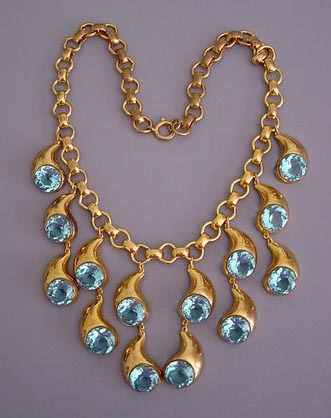 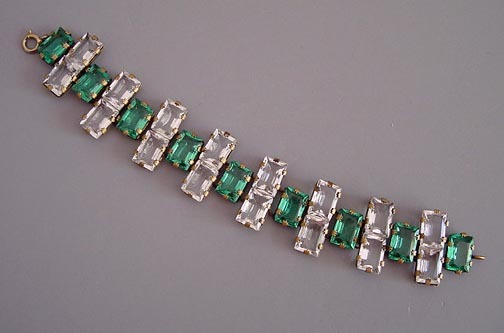 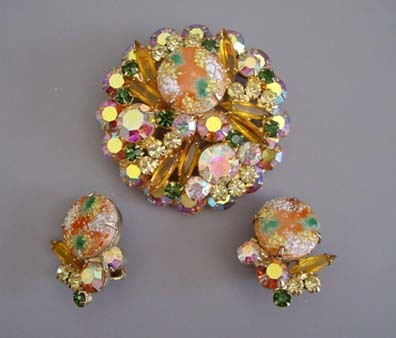 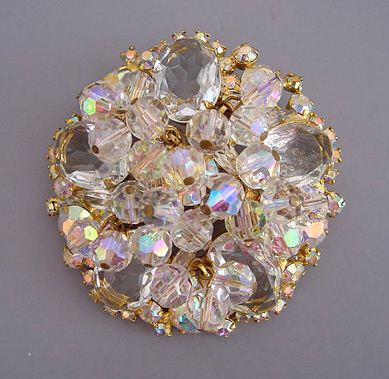 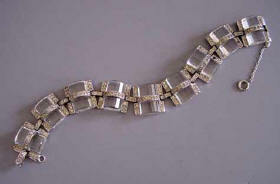 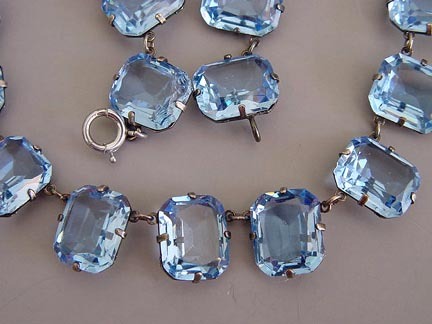 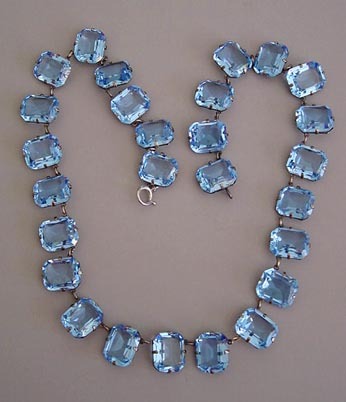 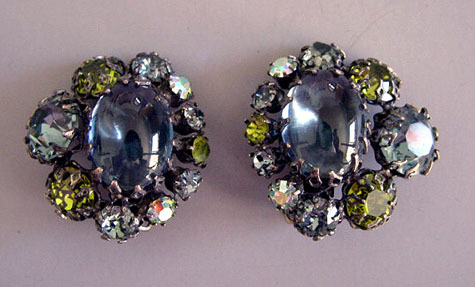 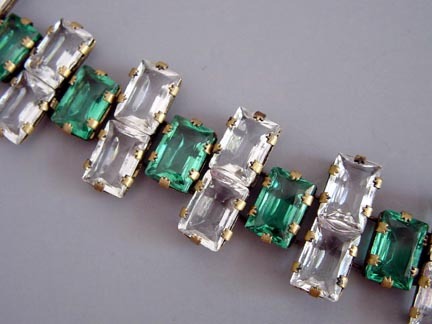 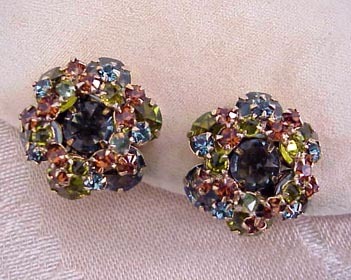 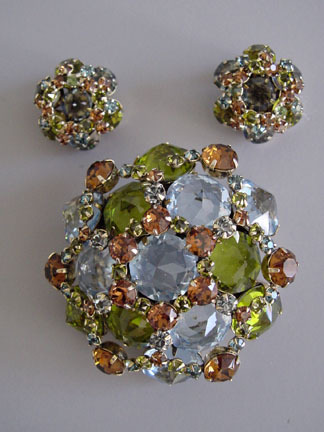 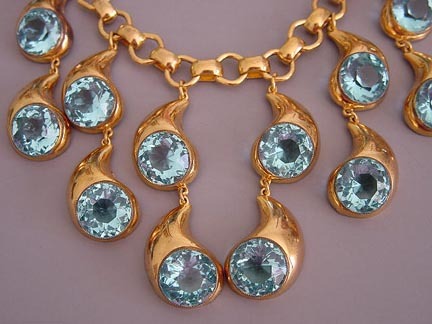 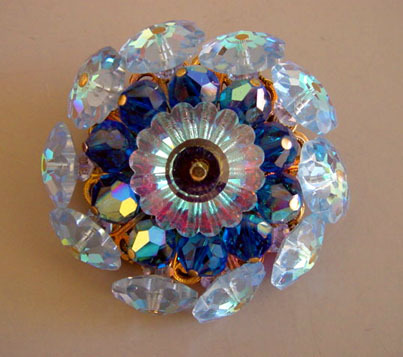 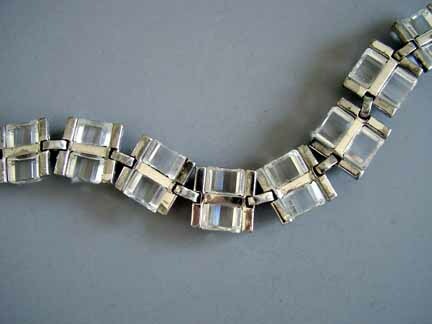 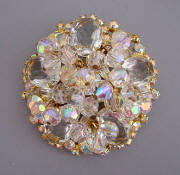 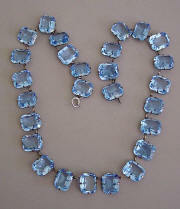 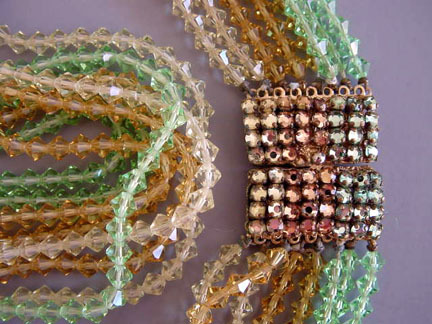 Aurora borealis, the iridescent rainbow finish on rhinestones, was developed by the Swarovski company in the early 1950's. 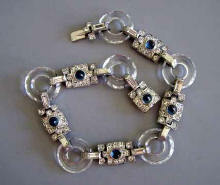 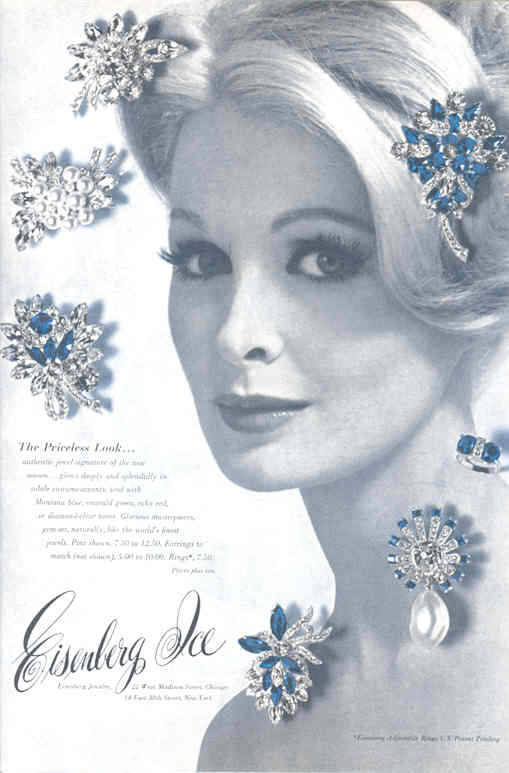 Vogue 1969 EISENBERG ICE "The Priceless Look"